This section of our website contains photographs that cannot be grouped together elsewhere. 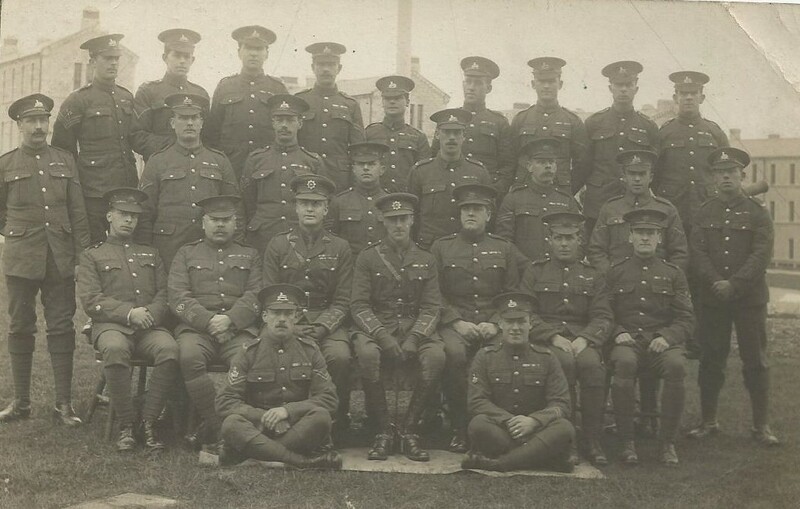 I am attaching a photo of the Lincolnshire Regiment with my father on it, 2nd row, last on the right: James B Smith. We think it was the 9th battalion of the Lincolnshire regiment. Perhaps if it was put on your web site with other photos, someone else might recognize the photo? Thank you. These photographs relate to my Great Grandfather: Frederick George Green, who joined the Army in 1900 and served in South Africa and India. Recently I have been going through my deceased mother's possessions and am intrigued by a fob watch with medallion attached which she inherited from her mother. 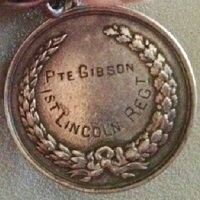 I believe the medallion belonged to her mothers brother Private C Gibson 1st Lincoln Regiment. 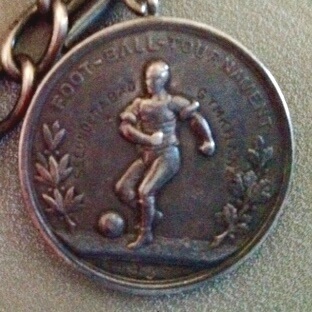 The medal was for participating in the 1905 Football Tournament in Secunderabad. l am the grandson of William Barnes, a former private (no: 4797755) of The Lincolnshire Regiment, and originally from Middlesbrough. 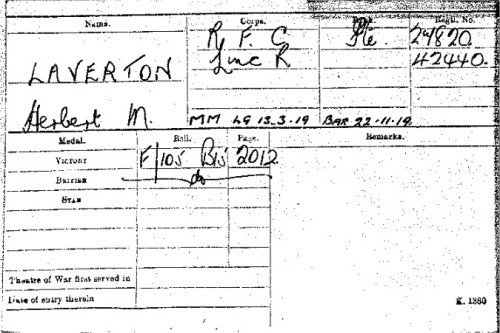 Born in 1908, he joined the Lincs in 1925 and served with the 1st Battalion until demobbed in 1933. He was then mobilised from the army reserve in 1939 and sent with the 2nd Battalion as part of the BEF to France in Sept 1939, by which time he must have been an oldie and well used to the army ways, twice promoted to Lance Corporal, and twice demoted! This photo is 'Bill' Barnes, (first on the left) and three of his buddies sat on a Bren Carrier somewhere in either Holland or Germany. I don't know the names of the three companions, but he was in the 2nd Battalion, Lincs Regt all during WW2, from the initial BEF in France and Belgium to the retreat to Dunkirk and then the return to Normandy in 1944 and the advance to Germany afterwards. 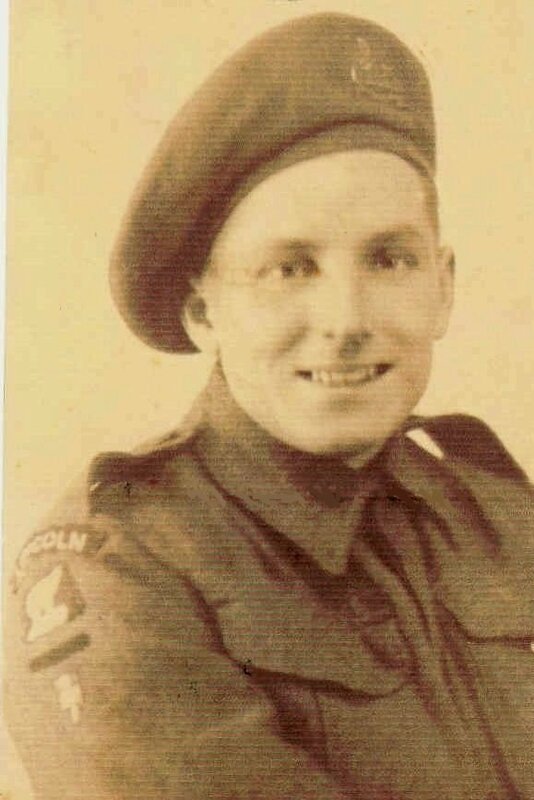 He is the L/Cpl W. Barnes mentioned in the Battalions official war diary who was part of the advance landing party with 185 Infantry Brigade on D-Day led by Captain PHW Clarke, to recce the Sword beach landing sites. 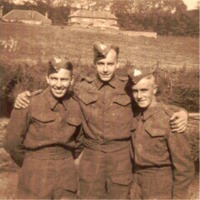 I attach a few photos from my Dad's army album. Please feel free to publish them on the Regimental website. 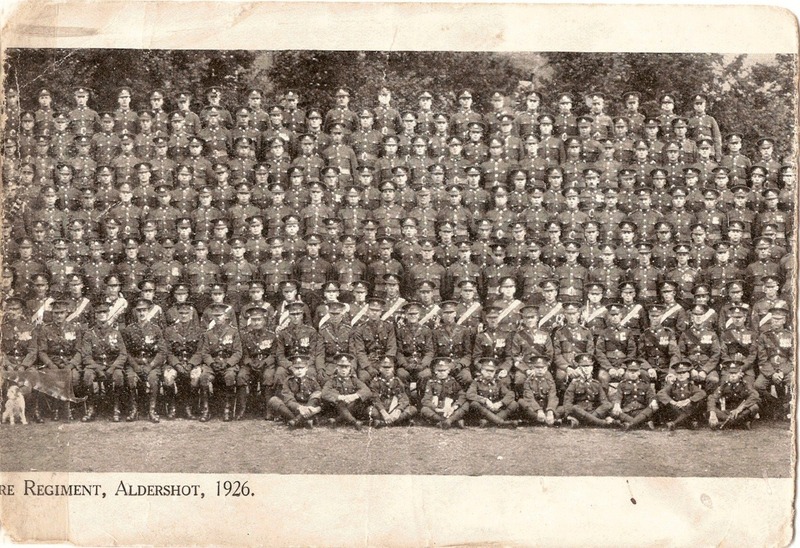 The 10th Battalion – Grimsby Chums: I see that you are asking for photos or memoires of any former members. I attach a photo of my late great uncle 21646, Private John Thomas Baker of the above battalion who died, aged 24, on 6 August 1916 and is remembered on the Thiepval Memorial. He lived the Steam Whistle, Holbeach Fen, Lincolnshire. Al Garrod, Webmaster, RA&RL Regt. Assoc. (Lincoln Branch). 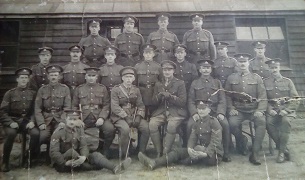 I can offer you this little piece of information to try and help - the Sergeant second in, on the second from front row, on the RH side of the photo is my father Alfred Arthur Spencer. 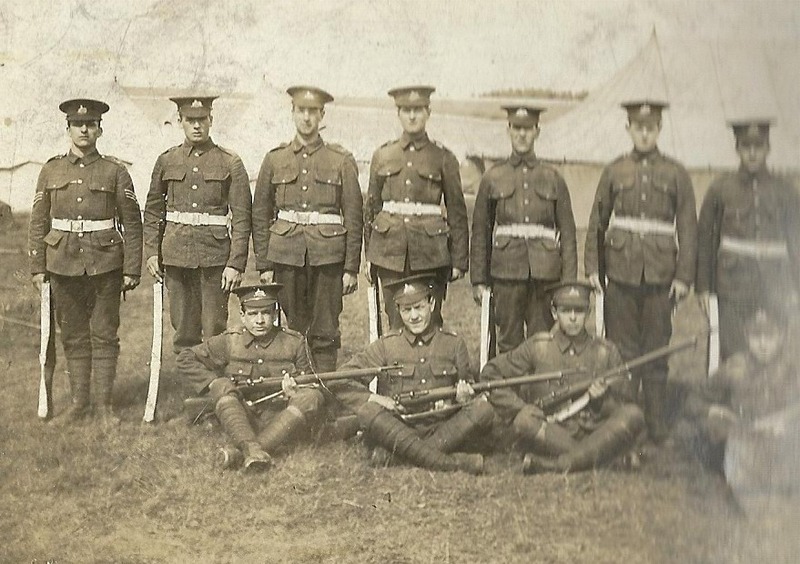 This then (I think) is the 1st Battalion Royal Licolnshire Regiment. As my father is wearing Sergeant's stripes, this would put the photo between December 1942 to March 1944. The regiment was in India at this time. 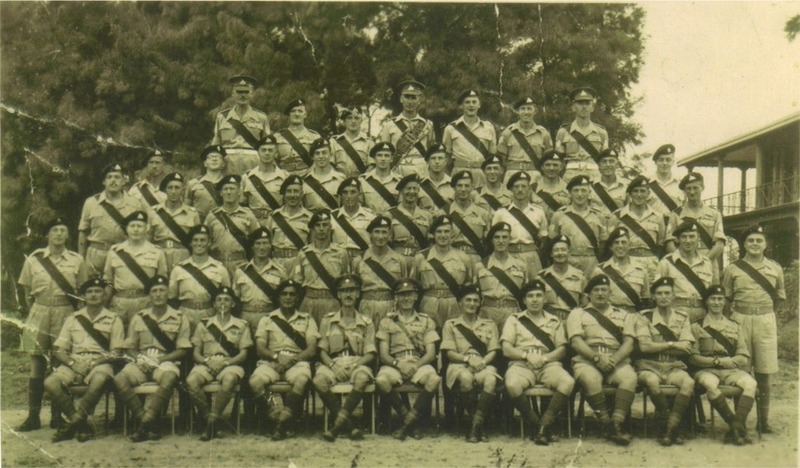 I would guess that the photo is of the Regimental Officers and Senior NCO's at that time. I hope that some of this helps. 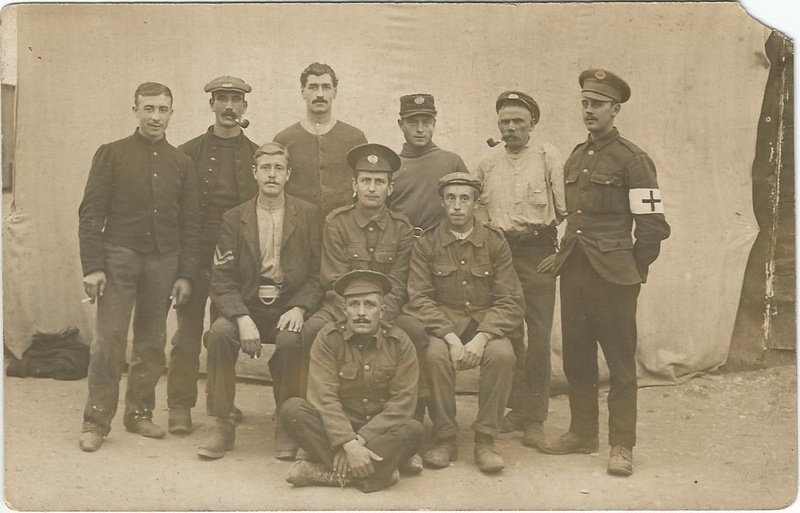 The man standing on the far right is my Great Great Grandfather, John Hollingworth (Born 1855, Denton; Died 1927, Grantham). I think the date of the photo is around 1880 - 1890. These photos were in a pile I got after my grandmother died a few years ago. 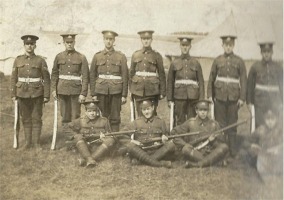 They can be identified as the Lincolnshire regiment and I would assume from around the first world war. No details on them apart from the one with the two names on. Rudkin was an relative of mine but we have previously been told there are no records of him. Photographs of this medalion were sent to us by Kev Brown. 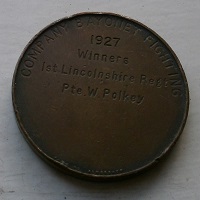 The recipient was Private P Polkey of 1st Battalion, The Lincolnshire Regiment. Unfortunately we do not know anything else about Pte. Polkey. As usual - if you can help with more information, or if you have seen an award like this before, please do make contact. Can you help with information about Anthony Flanaghan? Yesterday we remembered the liberation of our village in the south of the Netherlands in 1944. Among the soldiers that got killed in action was a boy of 25 years old, who still is buried in our local cemetery. 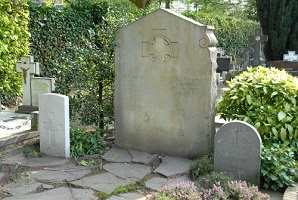 I attach a picture of his grave. 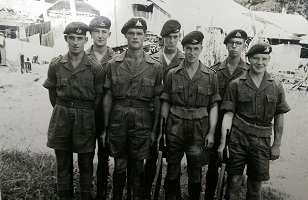 Our village was liberated by the Canadians but this boy from the English regiment for unclear reasons was here with them. It seems more complicated to find out that he was Irish. Little apparently is known about this soldier who used the name F.Kelly but officially was Anthony Flanaghan - born in Tuam, Eire. This last data is engraved in the large stone in the second picture. Do you have more information about this young man, who gave his life for us. Perhaps we can trace his family if any? Thank you very much. Thank you for your message and photographs. Unfortunately our Branch do not have the resources to engage in individual research of this type. If you agree, we could publish the photographs on our web site, with your email address, and invite readers to contact you if they have information about this man. Would you like us to do that? Thank you so much for your response. Your suggestion will help I believe. I look forward to some news. 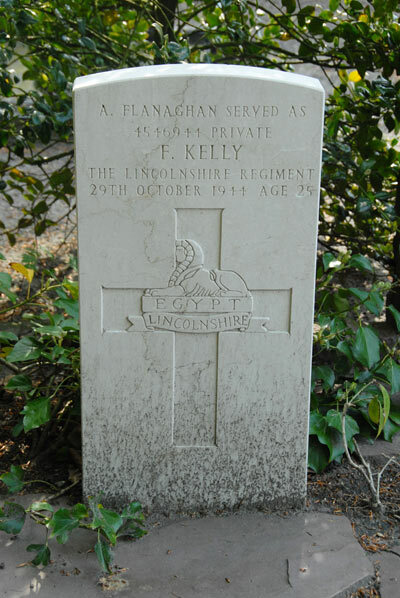 NB: Private 4546944 Anthony Flanaghan, of 4th Battalion, the Lincolnshire Regiment (enlisted as F. Kelly) is buried in Nieuw Ginneken Roman Catholic Cemetery, Ulvenehout. 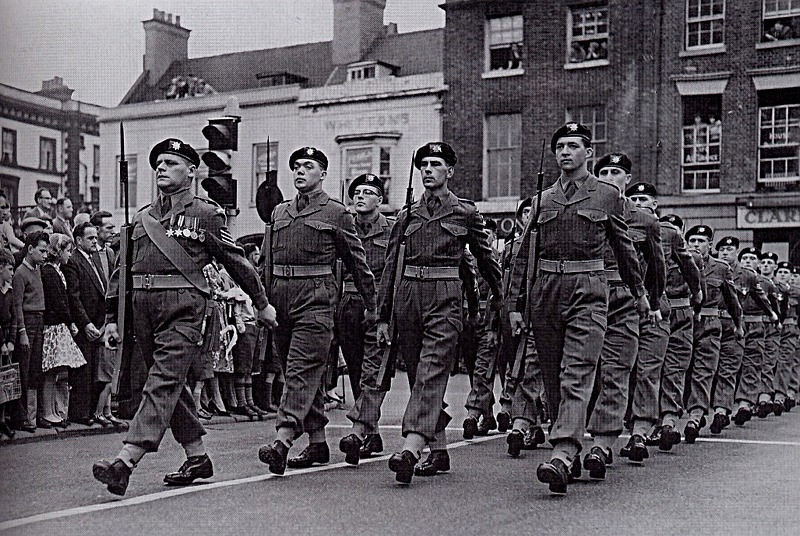 The 4th was a Territorial Army Battalion before War was declared. Hello Marijke, I hope you are keeping well? Regarding your questions about the Liberation of Ulvenehout - and specifically about Anthony Flanaghan - the Commonwealth War Graves Commission state that Private 4546944 Anthony Flanaghan (enlisted as F. Kelly and buried in Nieuw Ginneken Roman Catholic Cemetery, Ulvenehout, near Breda) was a soldier in the 4th Battalion, The Lincolnshire Regiment. The 4th was a Territorial Battalion before the war (part-time soldiers) so they were already trained, unlike new conscripts. 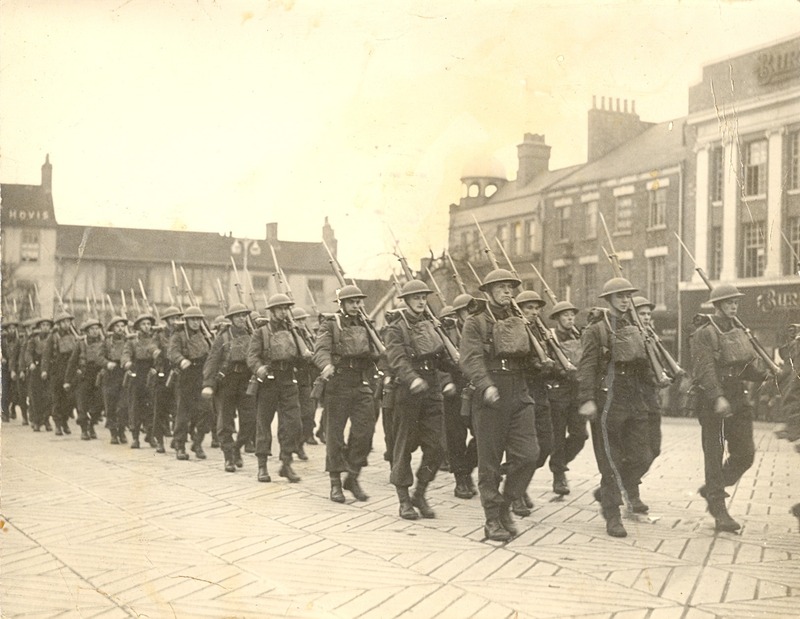 John Benson is an expert on the history of the 4th Battalion, and he may be able to help you by telling you about the movements of the 4th Battalion in October 1944. This may help you find out how this man from the 4th Battalion came to lose his life in the liberation of Ulvenehout on 29th October 1944. I have copied this message to John, so I hope he will contact you directly. Here is an extract from my book "Saturday Night Soldiers". Hope this helps. John Benson. 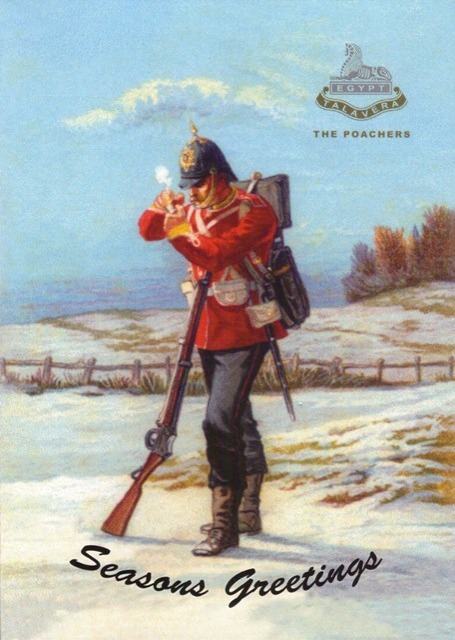 "The maps weren't all that accurate because since they’d been printed many of the trees had been felled, so patrols faced difficulties as there were now clearings and tracks in the forests which were not shown. It was hard to move silently because dry sticks crackled when the men walked over them. A small reconnaissance patrol led by Lieutenant Stanion ran into trouble when it was ambushed by some Germans. Only one man returned; Lieutenant Stanion and one of his men were taken prisoner and his sergeant was wounded. Things were generally quiet however, although the Germans sent over a few shells now and then." "On Monday the 23rd October, the 6th and 27th Canadian Armoured Regiments and a Belgian detachment were placed under the command of Lieutenant-Colonel Barclay DSO and together with the Lincolns became known as 'Impforce'. It was on this day that 'C' Company found a German who was laying anti-tank mines. They made him take them all up again before they brought him in. A Belgian civilian reported that there were some Germans in a farm near the village of Ulicoten, and a platoon from 'B' Company under Sergeant Jackson and a troop of tanks penetrated deep into enemy territory to investigate. According to the six prisoners who were taken, the Germans had had many casualties and were so thin on the ground that they were holding the front with just one company rather than at battalion strength. The following day, Second Lieutenant Priestley with a patrol of twelve men and a troop of tanks raided some buildings about a mile in front of the Lincolns' positions. 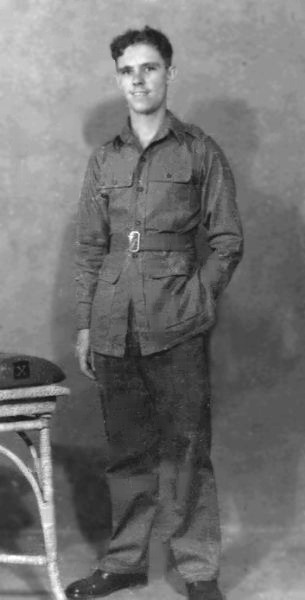 Under cover of fire from the tanks, the patrol rushed the buildings and killed twelve Germans—Sergeant Jackson accounting for at least three—and wounded three others. There were no British or Canadian casualties." "The Germans were withdrawing towards Breda and now that the Lincolns had replenished their stores and equipment they were being brought into action again. Lieutenant-Colonel Barclay was busy organising his 'Impforce'. Lieutenant-Colonel White and his 6th Canadian Armoured Regiment took over command of 'A', 'B' and 'C' Companies of the Lincolns in a section which was called 'Whiteforce' whilst 'D' Company was placed in 'Gorforce' with Lieutenant-Colonel Gordon's 27th Canadian Armoured Regiment." "'Whiteforce' set off towards Breda, nine miles away, on Saturday the 28th October, leaving 'Gorforce' in reserve on the Belgian-Dutch frontier in the Baarle Nassau area. The Lincolns enjoyed riding on the Canadians' Sherman tanks and fairly good progress was made along the cratered road. 'Whiteforce' was using a minor road instead of the more obvious better road, the tanks making short work of the relatively few pockets of Germans they met here and there along the way. They had a rousing reception from the Dutch villagers as they passed through Ulicoten but the Lincolns had to dismount from the tanks when they reached a crossroads near Couwelaar and they had to come into action to clear a position where they could stay the night. Several violent explosions were heard as the Germans blew up some strategic points but with the help of the tanks the Lincolns made a determined assault and overcame the opposition. But there were still some Germans nearby, and as they kept trying to infiltrate, the night was not a very restful one. 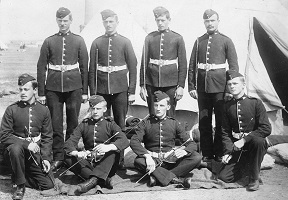 Eight men were wounded, including Major Flint, the Officer Commanding 'B' Company, but fortunately his wound was only slight and he was back in action about ten days later." "In the morning, 'Whiteforce' advanced a couple of miles and took two hundred prisoners and a fully-working 88mm gun. 'B' Company (now led by Captain Golding) and 'A' Squadron of the 6th Canadian Armoured Regiment had a 'pheasant drive' to flush a wood east of Ulvenhout. The Germans were driven west into Ulvenhout, onto the guns of 'C' Company and 'C' Squadron who were still trying to overcome resistance in the village and now found themselves having to solve the difficult problem of dealing with these new arrivals as well. Many Germans were killed, wounded or taken prisoner. Once resistance had ended, 'A' Company and 'B' Squadron passed through to attack Beiberg and then Ginneken, suburbs of Breda, which the Polish Armoured Division was also nearing from the east. As soon as these villages had been taken, 'Gorforce' came forward and then passed through them. A bridge over a river had been blown, but once a tank-borne bridge had been laid there was little further opposition and 'Gorforce' moved to the west to cut off the enemy's retreat route. When 'A' Company jumped off their tanks in the moonlight, they found several frightened Germans cowering in a ditch by the side of the road, one of them with a bazooka only ten yards away from a tank." "On the 30th October, 'B' and 'C' Companies, together with the Sherman tanks, swept a forest at Mastbosch whilst 'A' Company of the Lincolns was transferred to 'Gorforce' at Roskam. Riding on tanks, they took part in an unusual move to close a gap through which the Germans were escaping. What made the move remarkable was that it was not only made through a forest—not good tank country—but also at night. Every third tank was left free of passengers, and firing as they went along the objective was soon reached." "Contact was made with the Polish Division on the right and an American unit on the left. 'Impforce' entered Breda on the 31st October and concentrated in the area of the ancient Bouvigne castle (complete with a moat) which had been used by the Germans as a mess. Over a hundred and eighty prisoners were taken together with many machine-guns and countless rifles and small arms. 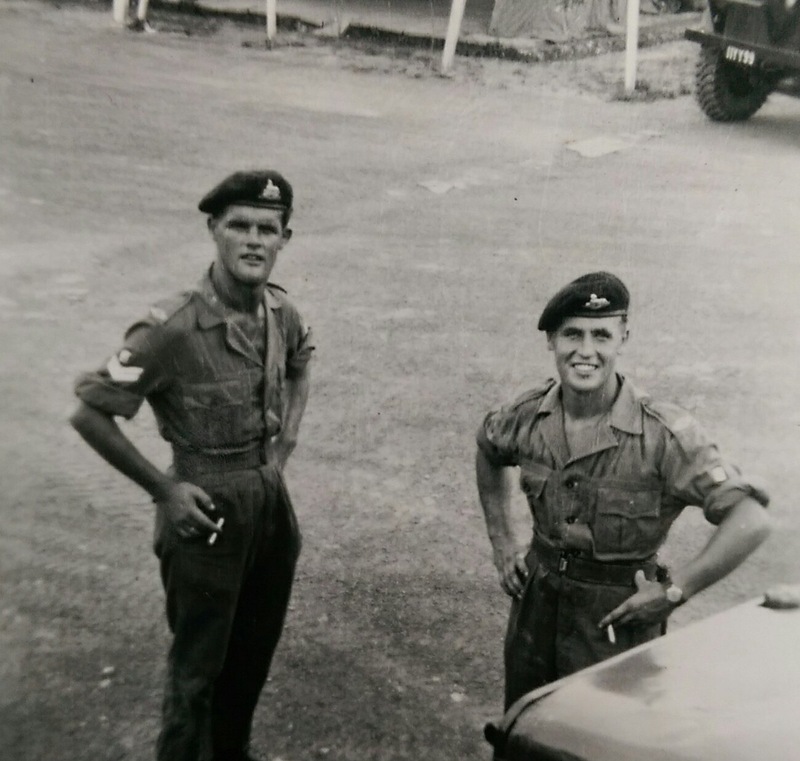 Much to everyone's regret however, 'Impforce' was disbanded after the extremely successful series of operations which had been carried out with the 2nd Canadian Armoured Brigade. Friendships had been struck between the Lincolns and the Canadians at all levels—platoon/troop, company/squadron and battalion/regiment—and as a result there had been very close co-operation and perfect mutual understanding. Everyone was disappointed that the partnership was being broken up and strenuous efforts were made to keep it intact. Brigadier Bingham, the Officer Commanding the 2nd Canadian Brigade, tried hard to keep the Lincolns permanently as a motorised battalion, but it was no use." "The Lincolns enjoyed a few days rest in the beautiful surroundings of the Chateau Bouvigny on the outskirts of Breda. The trees in the nearby forests were a wonderful colour in the late autumn sun. But it was not all rest, for Lieutenant-Colonel Barclay—whose mind was always on the alert—assembled the men to go through the lessons which could be learned from the most recent actions whilst they were still fresh in everyone's minds. He congratulated everyone for doing an excellent job, particularly the patrols for penetrating so deep into enemy territory. He read out messages which had been received from General Barker and the Officers Commanding the Polish Armoured Division, 146 Brigade and the 2nd Canadian Armoured Brigade, congratulating the Lincolns for the fine work they had done in the past few days. Expressing his thanks for the excellent work which the Lincolns had done on his left flank, the Polish general said: 'It has been a source of deep satisfaction for my officers and men to work so closely with such a fine team.'" "On Thursday the 2nd November, a ceremonial parade was held in Breda. Dutch and Allied flags were to be seen everywhere and the whole population of the town lined the streets and cheered wildly as the troops marched by. 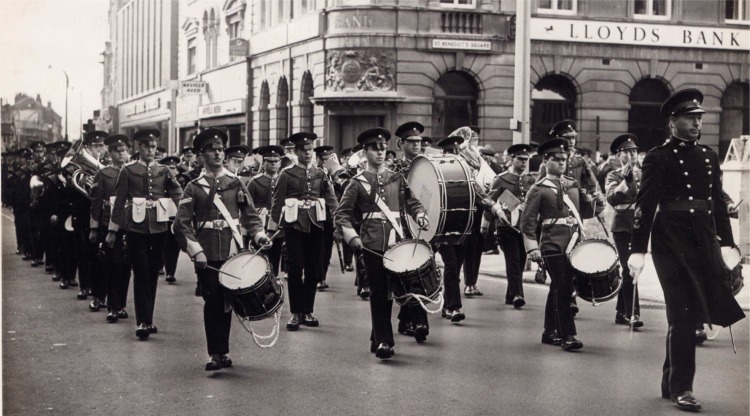 A Canadian army band which had somehow appeared from nowhere played as the troops marched past Brigadier Bingham who took the salute." "It was back to business the following day, when the Lincolns rejoined 146 Brigade at Roosendaal. 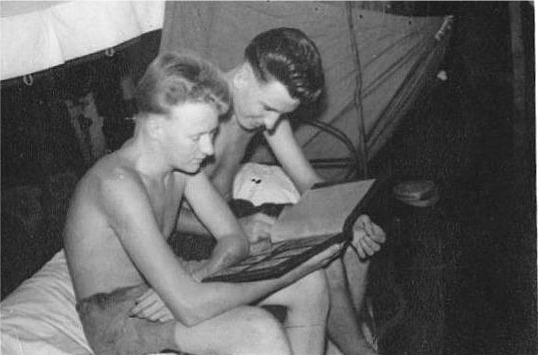 When they arrived they were placed under two hours notice to move, but they were stood down and had a day's rest and a shower in the mobile bath unit instead. On the 5th November the battalion was ordered to support the KOYLI in taking the village of Klundert, but they were later redirected to the Tonnekreek area when it was learned that the KOYLI had entered the village unopposed. Klundert was however a mass of flames, with houses burning on both sides of the road. The Germans had set fire to the village before leaving." Thank you so much for this amazing script. Coming from the area I've read it with great, great interest. 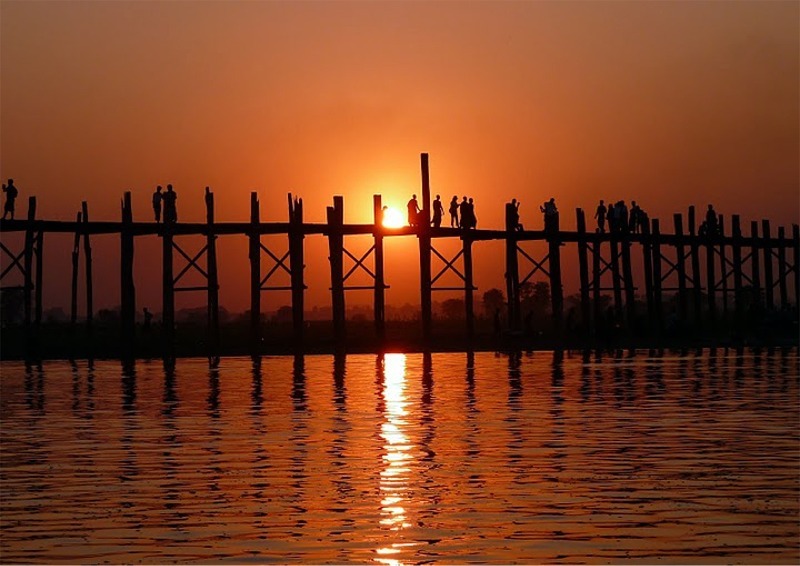 In fact my mouth fell open – recognizing every place, recalling stories of my parents and villagers, putting bits and pieces together. I will inform the local war museum and our village heritage society (General Maczek Museum in Breda city) about your book and this particular chapter. I wonder if they own it already. In terms of the described happenings the author keeps track of casualties but apart from one wounded soldier - Major Flint. Thank you for your email. I know of only one veteran who is still alive – and he lives in Australia! 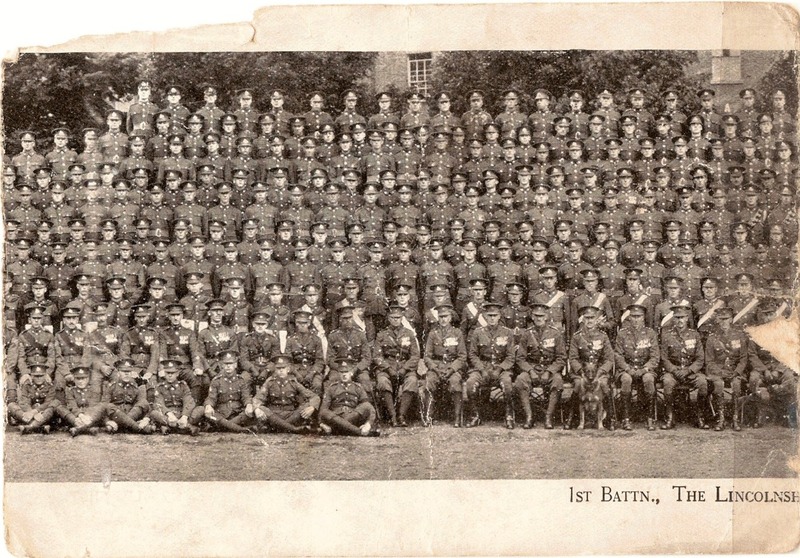 There were various sources of information which I put together for the story, but principally I relied on the battalion's war diary which every unit kept on a day-to-day basis. 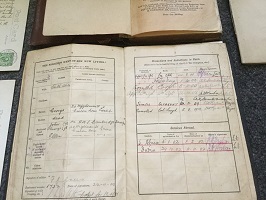 These diaries are kept at the National Archive at Kew in London. The battalion also started producing a newsletter at about this time and I possibly used bits from that as well. I can't really remember now. It is a pity that I don't have details of how the casualties occurred. I'm pleased you found the extract from my book helpful. Please can I join in your facinating conversation? I have made contact with a 2nd cousin of Anthony Flanagan and she has a letter he wrote home to his family. She is going forward me a copy after Christmas. Thank you so much. Our local village museum is at this moment commemorating 70 years of WW2 liberation with a small exhibition. It is running till April next year. The society and villagers would be happy if we can include 'news' from our soldier and his background in the museum collection. 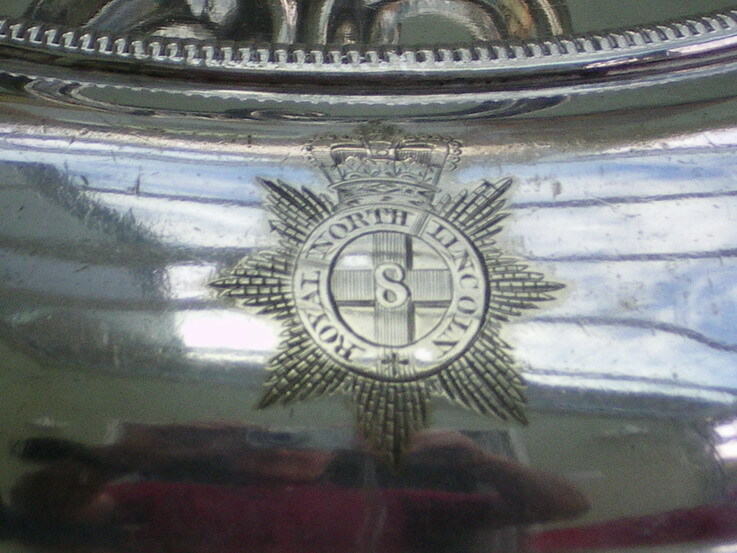 I have a silver plated vegetable warmer with a crest consisting of the words 'Royal North Lincoln' surrounding the numeral 8 in a St George Cross (possibly indicating part of the Eigth Army?). Before I dispose of this locally in Devon, I thought it worth a try to see if it might be of interest to the successor Regiment and Google gave me your contact as the most likely to know who I should ask. Any suggestions will be most welcome. 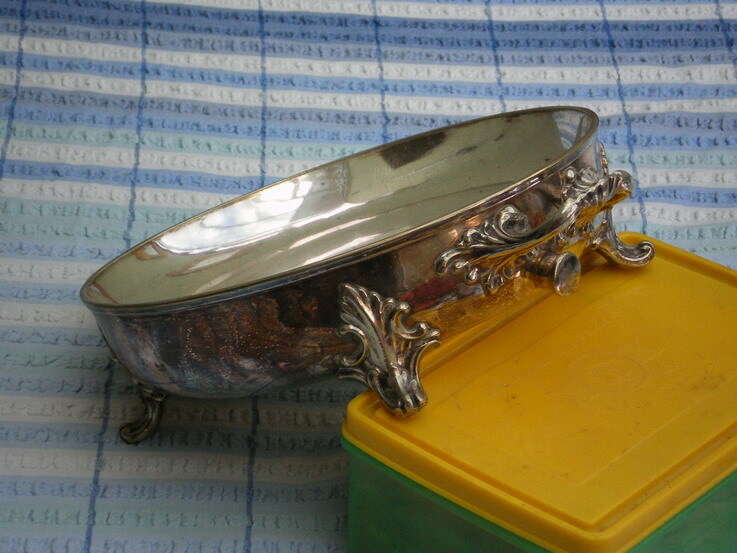 It is very exciting to see this piece of table silver. 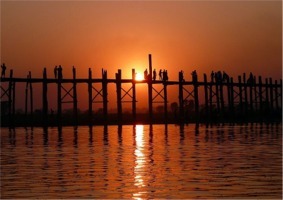 Thank you for sending the photographs to us. 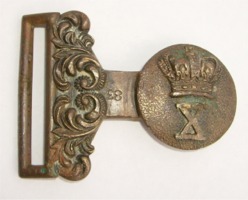 The badge on this item is not of the Lincolnshire Regiment, not is it from the 8th Army. It is from the 8th Loyal North Lincoln Militia - a much more ancient fighting force. In the name of this Militia, it is generally accepted that "Lincoln" is used as an abbreviation for "Lincolnshire". There was also a South Lincolnshire Militia. Their Barracks in Lincoln (now a museum) was built in 1857. 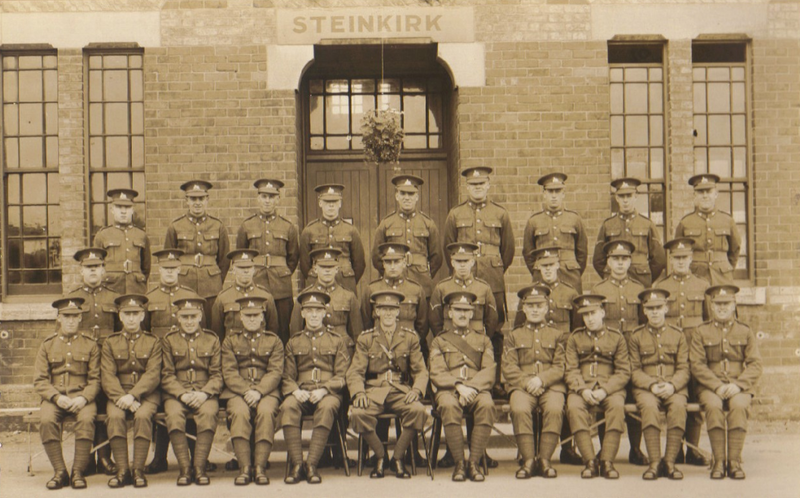 By 1922, the "Old" Barracks had become the HQ of the 60th Field Regiment of the Royal Artillery. The "New" Barracks (for the Lincolnshire Regiment) was not built until the late 1870s. 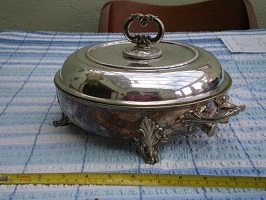 So this would suggest that your silver vegetable warmer may date from sometime before 1880. And I thought it was just a piece of standard Regimental silverware! Many thanks for your research: I'm not sure where we got it from, so will try and do a bit of research our end. In the meantime, please feel free to add our contact details on the Regimental website. Many thanks and will be in touch again if I can find out anything more this end. My name is William Seaton and I am the youngest son of my deceased father who served from 1932 until 1946. 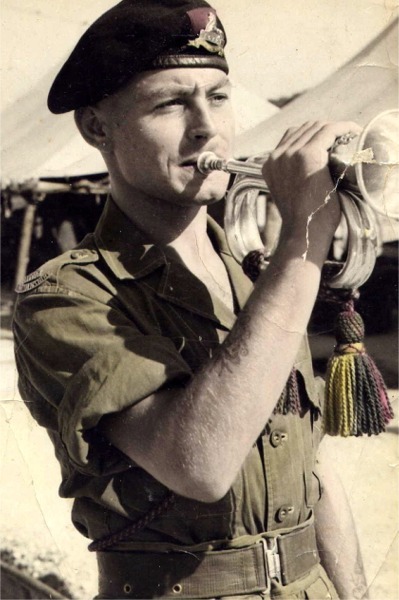 He was Norman Seaton and served with the Second Battalion until he was promoted to Lieutenant Quartermaster in December 1944 when he went out to South East Asia Command, India and Burma. He served in Malta and Palestine and with the BEF in Belguim and at Dunkirk. 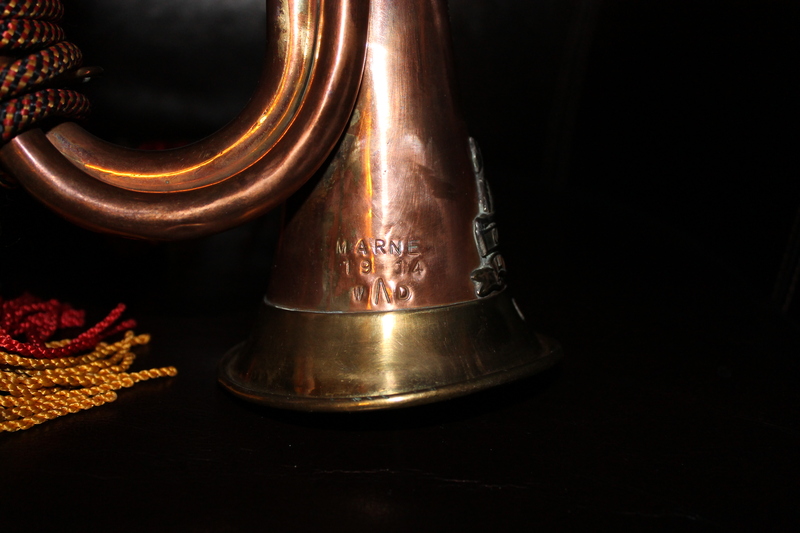 At the time of D-Day he was the RQMS. 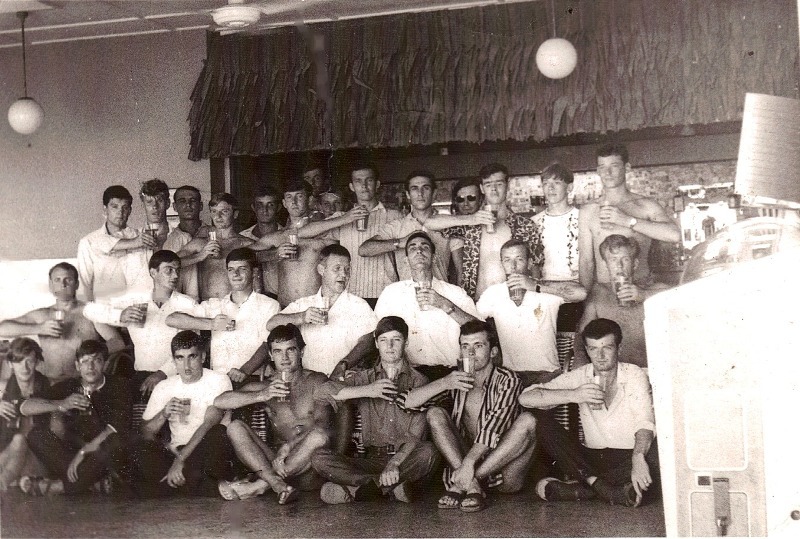 The photograph of the troops was taken at a concert party in Malta prior to their time in Palestine. 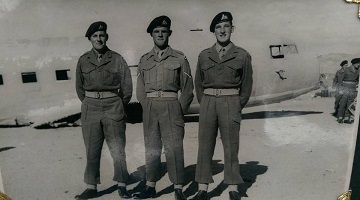 The other two are of my father when he was in the 2nd Battalion and then the 1st Battalion. 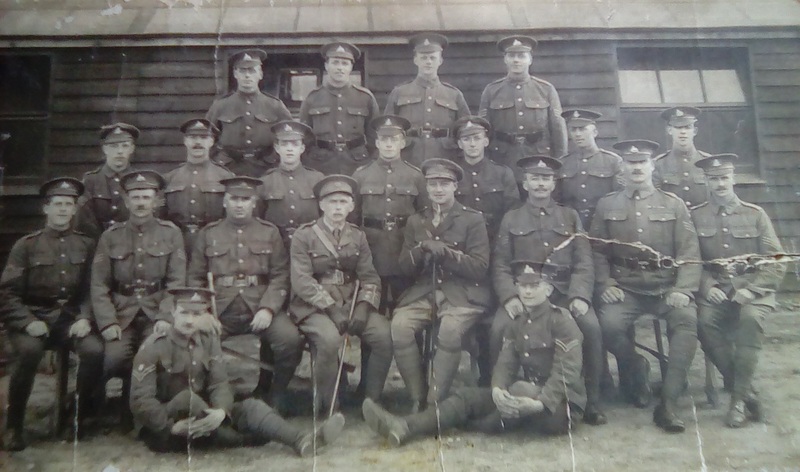 I thought you may be interested to have the accompanying photograph of my grandfather (seated right as you look at the photo) and fellow soldier for WW1 Lincolnshire Regiment records. 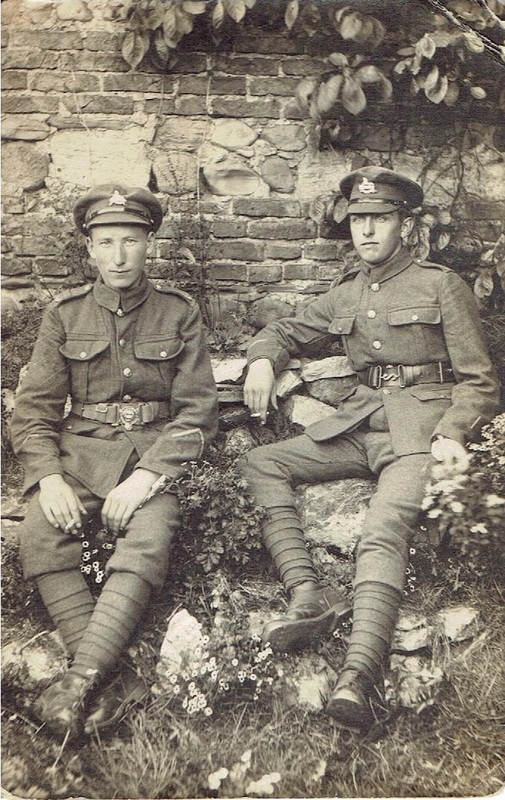 William Henry Brace (born 28 Dec 1898 in Hertfordshire) served in WW1 firstly with the Queens Own West Surrey Regt (service no 157910) and subsequently with The Lincolnshire Regiment (possibly the 5th Battalion). I know that he was injured - presumably whilst serving in The Queens Own and at some time served in Northern Ireland and also believe he may have guarded German POWs in France as there have been some items of trench art passed down to me (decorated shells and bullets). Unfortunately I believe his service records are among those which were destroyed by the fire in WW2, as the only information I can find online is his medal record. 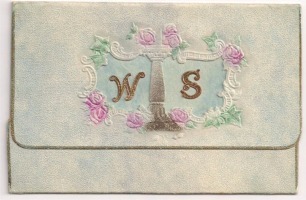 The photograph is of postcard form with the details "West Park Studio (Hull and Ripon)" on the reverse. I am afraid I do not know the identity of the other soldier in the photograph nor where/when the photo was taken. 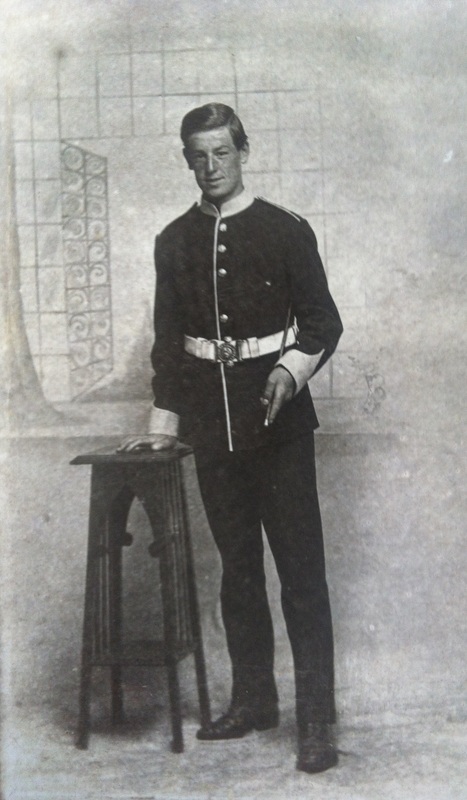 This is a picture of my Great, Great Grandfather: Pte Francis Edgar Boughton. Written on the back was "can you notice the button undone, not very good is it!" Unsure of date but we suspect it is some time before the battle of Hohenzollern. 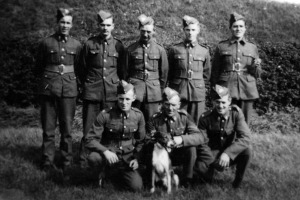 This photo has my uncle Private Frederick Billings Number 4801931 (back row, 5th from left). He died 1st March 1945 and is buried at Reichwald Forest War Cemetary. Could you confirm whether this photo was taken in the Lincolnshire Barracks? Have you got this picture in your files with the names of the other people in it? My uncle joined the Army in 1936. Any information you have would be gratefully received. If you can help him with any further information, please telephone Richard Furbisher on 01623 460670 or 07930 892601. These pictures were sent to us in October 2013 - the owner bought it about 20 years ago - but could not provide any idea of it's history. 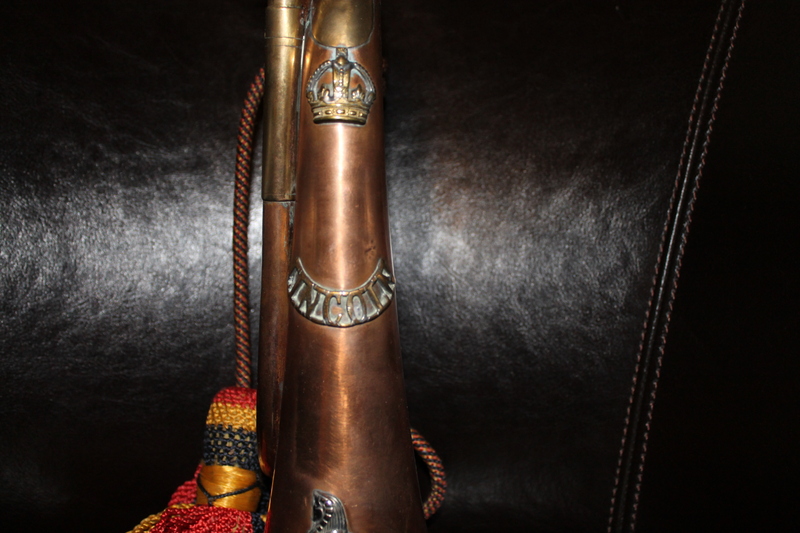 If you can verify the authenticity of this bugle, or can supply any information on Bugler Lawrence, please do contact us. 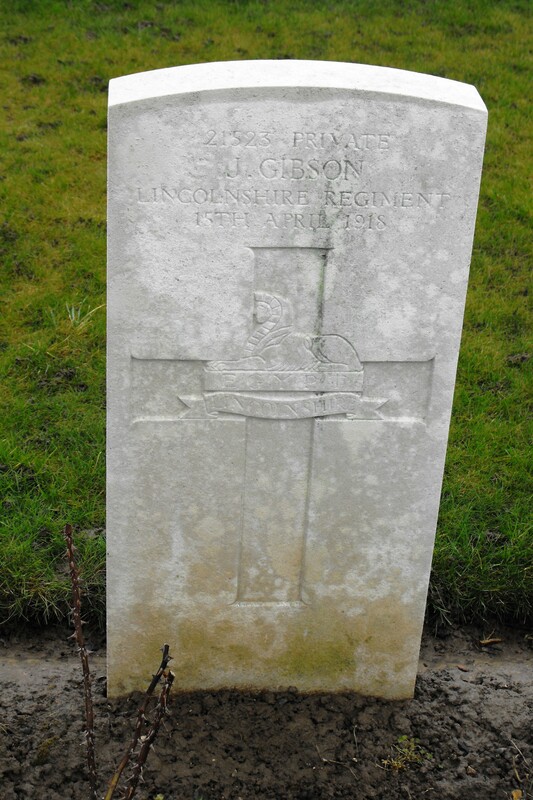 "The photograph of J.Gibson's headstone was taken in Varennes Military cemetery, the Commonwealth War Graves Commission (CWGC) states he is J.Gibson, 21523, 7th Battalion. I cannot find any entry in SDGW. The only J.Gibson being James Thomas of the 6th Battalion who died of wounds in Gallipoli and Jonathan Gibson, 2nd Battalion who was killed in action on 4th March 1917. 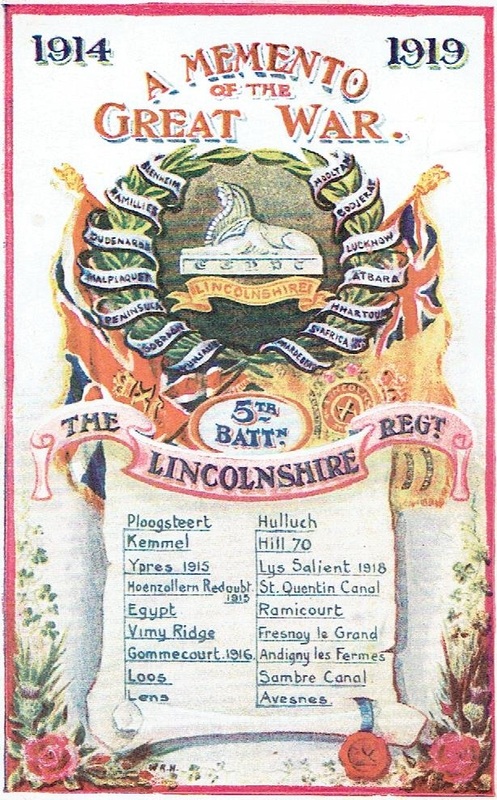 There is no entry for the Lincolnshire Regiment with the number 21523. neither is there any J.Gibson under the 7th Battalion in the Roll of Honour at the back of 'The History of the Lincolnshire Regiment' by Major-General C.R.Simpson, in fact the only records for a J.Gibson being those above." "John William Greenwood is another where there is a difference of opinion. 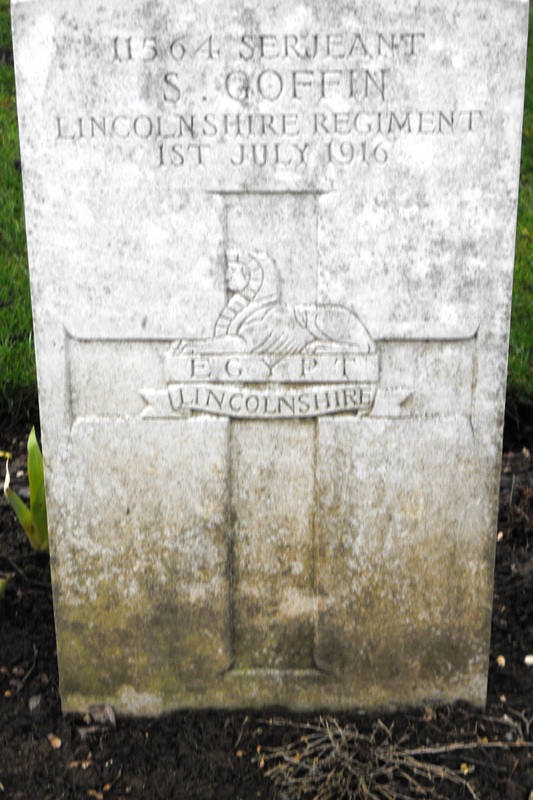 CWGC states Lincolnshire Regiment, 12th Labour Company transferred to (9639) 17th Company, Labour Corps. 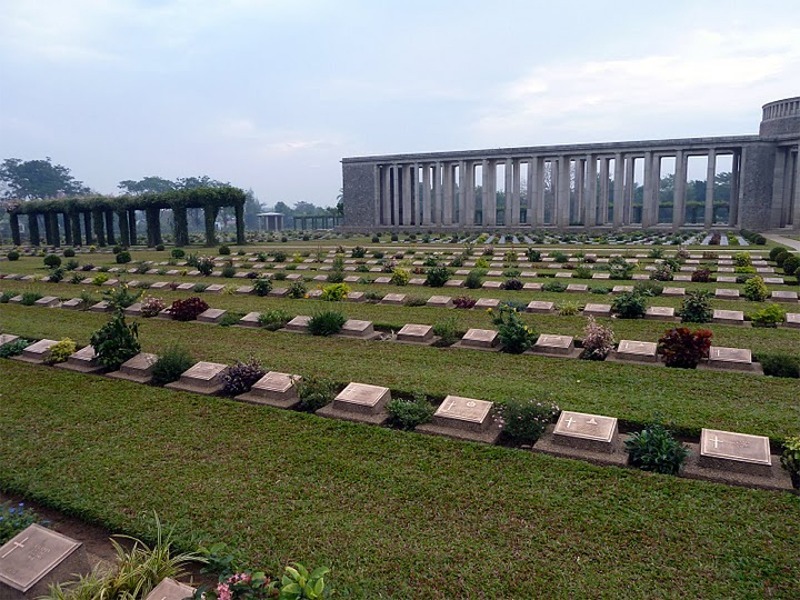 "Soldiers Died in the Great War" (SDGW) states 9639 Labour Corps, no entry appears in the Regimental Roll of Honour. Should he be shown as Lincolnshire Regiment or Labour Corps? If the former, his name needs to be added to the Roll of Honour, if the latter should not the headstone be changed?" 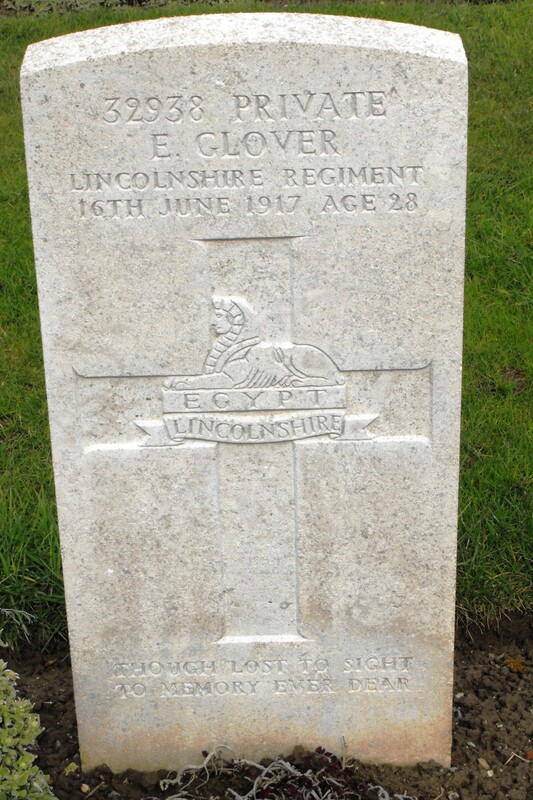 "Edwin Glover is another member of the Lincolnshire Regiment for which there appears to be some confusion. 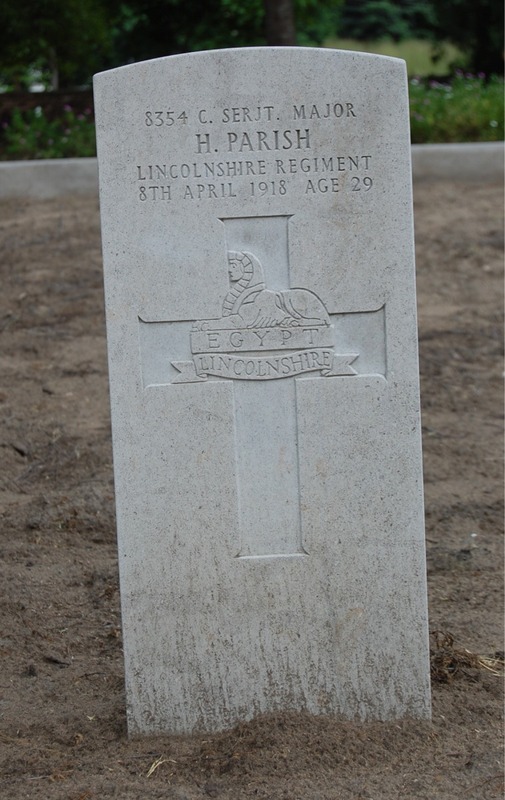 CWGC has him as the 10th Battalion but he is not on the 10th Battalion Roll in Grimsby St.James. SDGW has him as the 8th Battalion and he also appears as such on the Regimental Roll of Honour in Lincoln Cathedral. Photograph taken at Faubourg d'Amiens Cemetery, Arras, Pas de Calais, France." 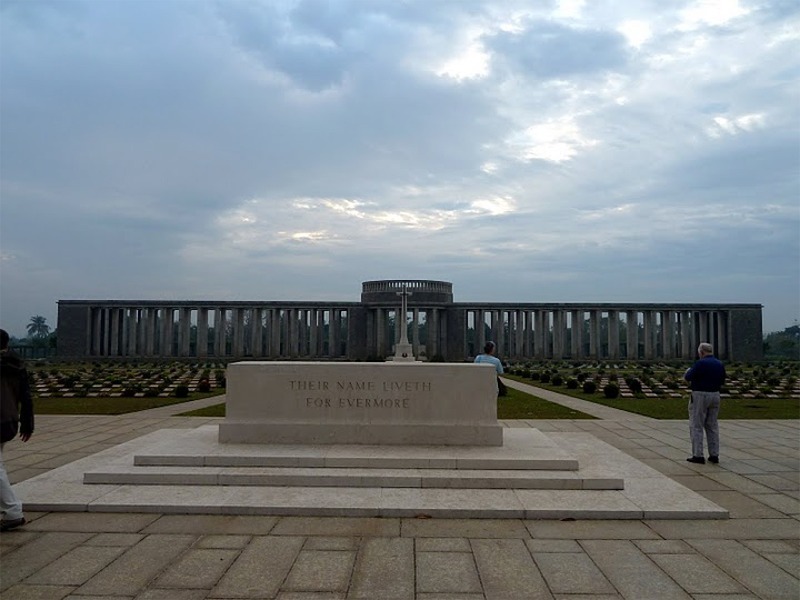 "S.Goffin is another where there is conflict of entry CWGC states 8th Battalion but SDGW and the Regimental Roll of Honour state 1st Battalion." 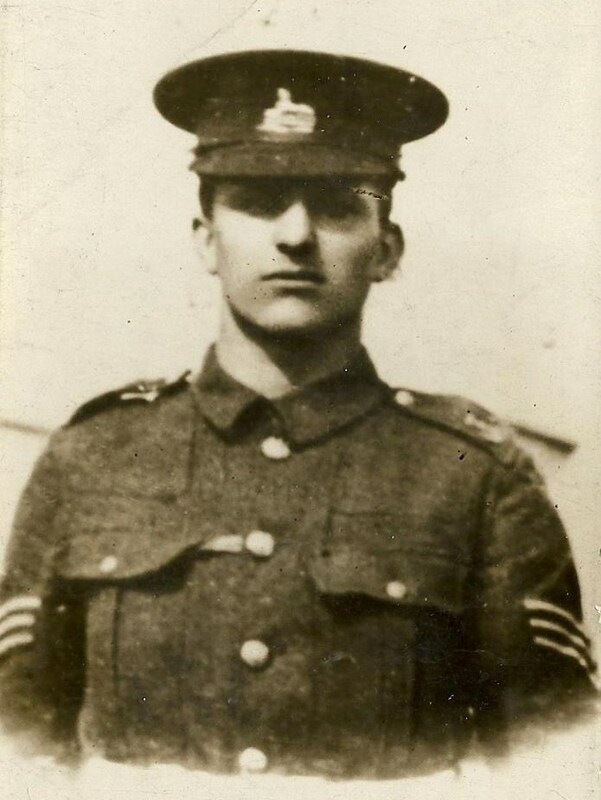 Edwin Glover served with the 8th [Battalion] as well as the 10th [Battalion] Lincolnshire [Regiment]. The units are shown in this order. It looks like the admin staff either missed a transfer back to the 8th or he in fact died with the 10th. 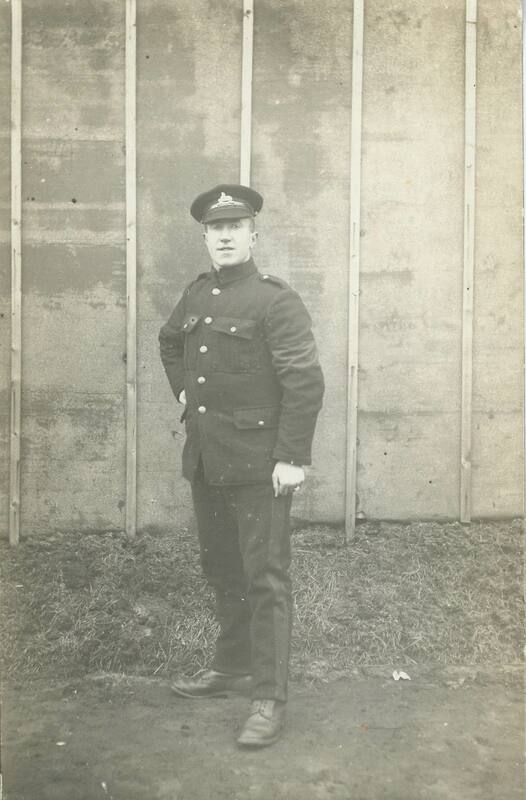 My maternal grandfather was Joseph GIBSON, who I believe may be one of the men subject of an entry on the Association's website entitled, 'The Mystery of Four WW1 Soldiers'. According to my family history research, my grandfather, Joseph GIBSON was born in 1889 in the Spilsby area. 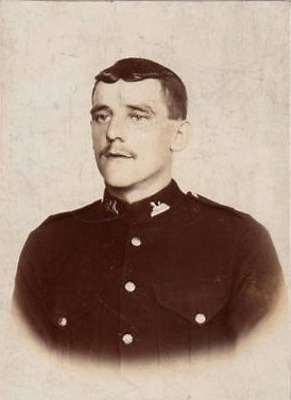 Prior to his military service in World War 1 he was a member of the Lincolnshire Constabulary and is included on their Roll of Honour, which was formerly held at Lincolnshire Police Headquarters but may have since been deposited at the Museum of Lincolnshire Life. 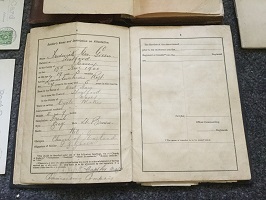 The date of his death recorded on the Police Roll match that of Private J Gibson, Service Number 21523, listed on the Commonwealth War Graves Commission website as being buried at Varennes Military Cemetery. In common with many other families, the Gibsons paid a very high price for our freedom. Both of Joseph's brothers, Private Robert GIBSON (Service Number 10284) and Private Jonathon GIBSON (Service Number 22619), also lost their lives in WW1 on 16th November 1916 and 4th March 1917, respectively. Robert is commemorated on the Thiepval Memorial and Jonathon lies in Fins New British Cemetery, Sorel-le-Grand. 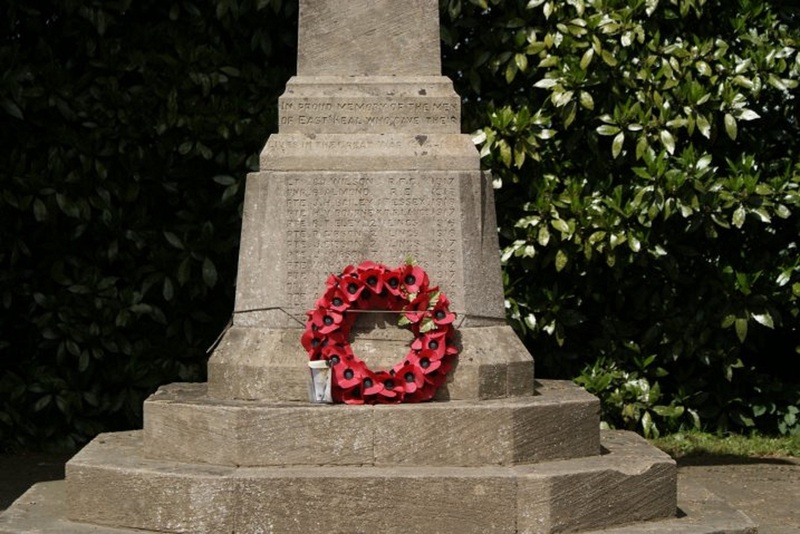 This 'Band of Brothers' were all members of the Royal Lincolnshire Regiment and are commemorated together on the War Memorial at East Keal near Spilsby. 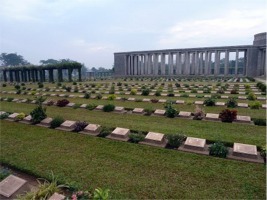 I have attached a photo of the memorial. Robert and Jonathon are both shown as members of the second battalion, while Joseph was a member of the seventh battalion. 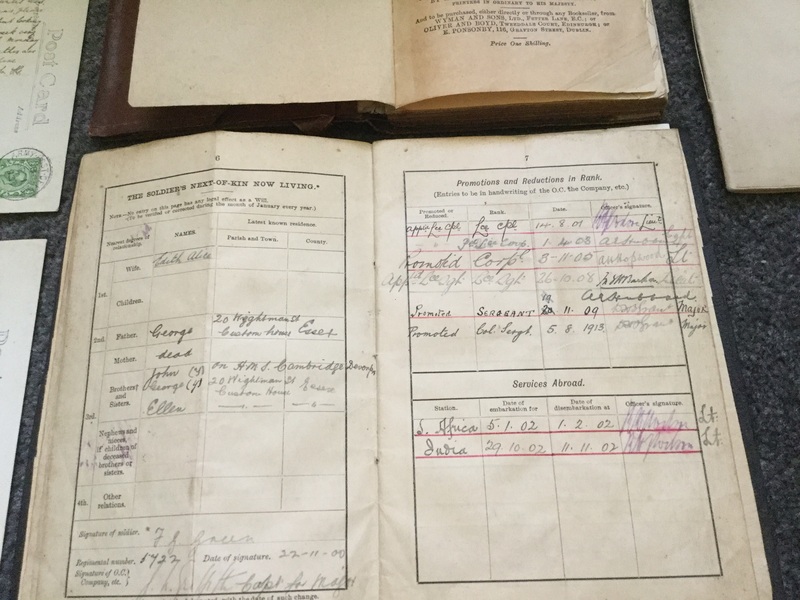 Recognising that 2014 marks the centenary of the outbreak of the First World War and as a small tribute to the grandfather and uncles I never knew, I am researching their lives with a view to compiling a record to be passed on to my own children and grandchildren. I am pleased to have been able to visit the Association's website and intrigued by the apparent disparity in records concerning my grandfather. I would be happy for any of the information above to be added to your website by way of an update to the entry to which I have referred, should you so wish. 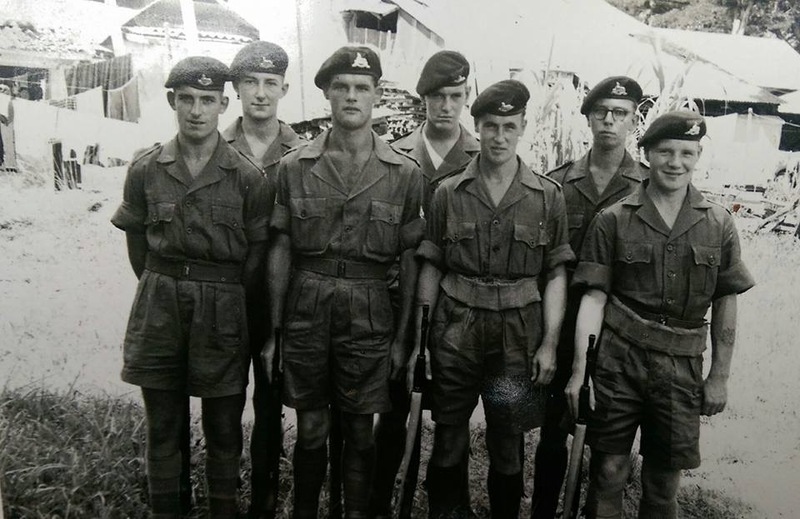 "Please find attached a photograph of the Lincolnshire Regt in Malaya in 1957. 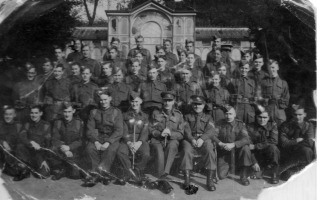 I'm unsure of what Battalion it is, however I can name all of them thanks to the help of my grandad. Edward Bark who is pictured in this photo as well as some others on your website. Some of those picture are locals from what my grandad can recall. Could you please post this on the website, as well as my email address, so if anyone would like to get in touch with my grandad then they can? 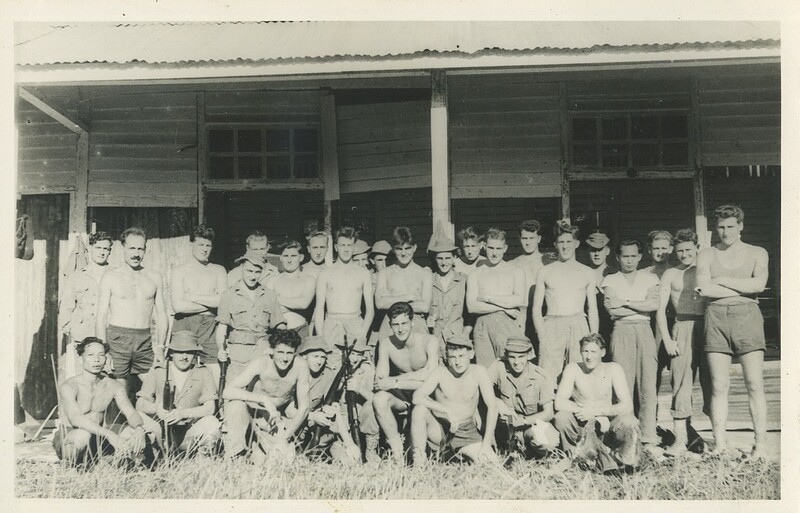 Holly Ferneyhough - email: iccle_devil30@hotmail.com"
I have just seen the recent photo of the men in Malaya. 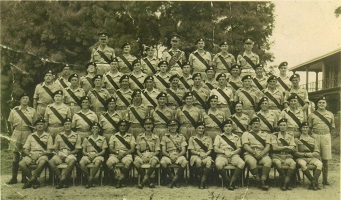 The photo date cannot be 1957 as one man in the photo, 2nd Lt Ogden, was killed in November 1956. 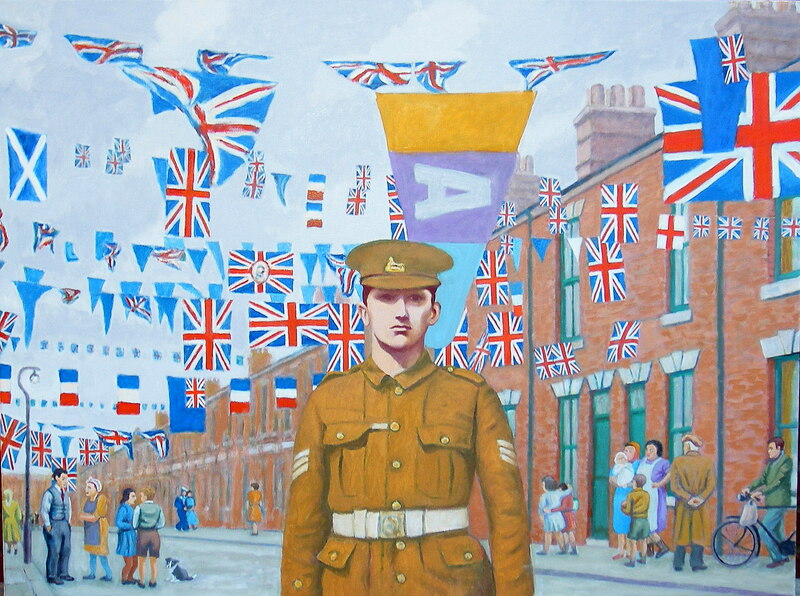 Painting: John A Walker, 'Patriots' (2012). Oil on linen, 90 x 120 cm. The central figure in this painting is my paternal grandfather Sergeant Albert Victor Walker who served in the 1/5th Territorial Battalion of the Lincolnshire regiment during WW1. He was killed by the Hun on 13th October 1915 in an attack on the Hohenzollern Redoubt near Loos. Virtually the whole battalion and all but one of its officers were wiped out. 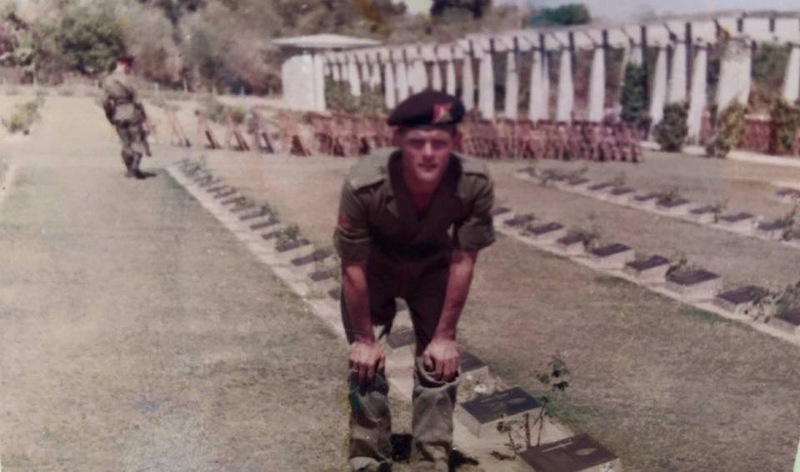 His body, like 97 per cent of his dead comrades, was never found. Albert left a wife and four children. They lived in Duncombe St, Grimsby. Family legend has it that Albert left for the front without a fond farewell from his wife because she had asked him not to go (it seems he could have remained to train new recruits). He was a man I never met but I have often wondered what he was like and whether or not he had any misgivings about the war. There is a physical connection between us because I inherited some of his genes. 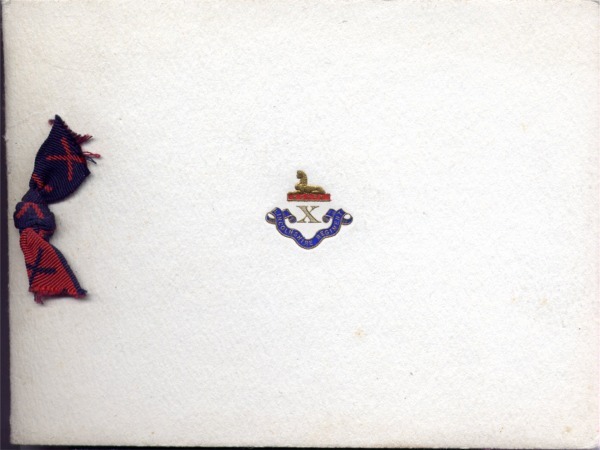 My father served in the British army in WW2 - I remember handling his cap badge - the Sphinx in Egypt (a motif derived from a campaign against Napoleon involving the Lincolnshires in 1801) and, fortunately, he survived. 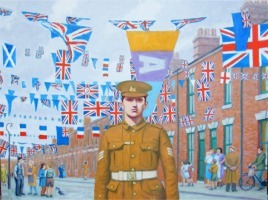 Behind Albert is a view of Hope Street, Grimsby at the time of the VE celebrations in 1945. Hope Street was not far from Albert's home and its inhabitants were equally patriotic. Although it was one of the poorest streets in the town, it always had the biggest display of flags. I spent the first ten years of my life in such a red brick, terrace house without a front garden (in Newmarket St) and no indoor lavatory or bath, and soon my ambition was to escape from this restricted, working class background. However, I cannot think of such streets without nostalgia and a mix of emotions because although I wanted to leave them, they were my home and my future wife Margaret also grew up in a similar environment in Newcastle upon Tyne. Mostly these streets were knocked down and 'redeveloped' in the 1960s and 1970s. 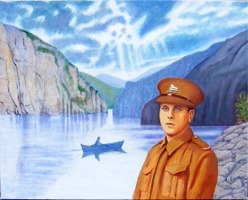 This painting features a portrait of my father, Albert Clifford Walker, in British army uniform. He served in the Royal Lincolnshire Regiment during WW2. In 1945 he was sent to Norway to assist in the liberation of the country from the Nazi regime. By the time he arrived the Germans had surrendered and so he spent his time guarding German sailors and soldiers from the angry Norwegians. 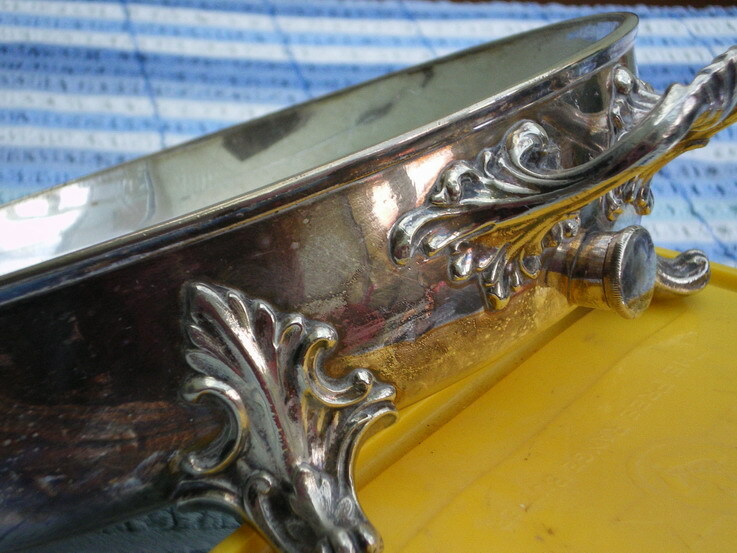 When he was demobbed and returned home he brought with him some war booty (such as a Nazi dagger), and souvenirs such as postcards and tourist booklets about Norway and its fjords. I recall that the images of the fjords fascinated me and I used to spend my evenings copying them in watercolour on our kitchen table. 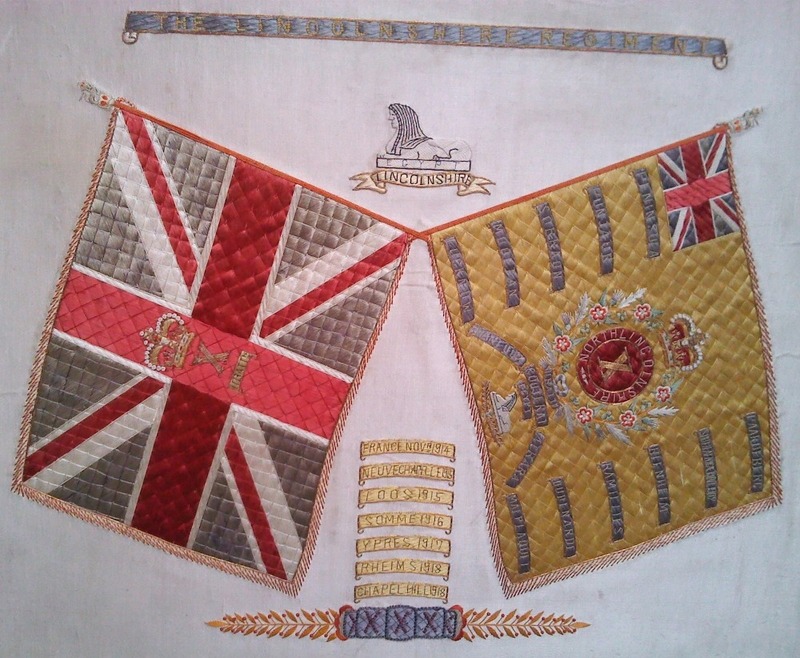 In clearing a family loft recently, I found this old silk (picture attached). It measures 53 x 58 cm, and had been pasted to card, at one time had been mounted in a picture frame. 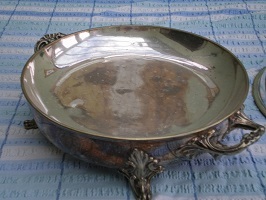 It is a little grubby, but is in good condition, considering its age. The silk represents the Regiment colours and 11 Battalion, which I understand was a reserve regiment. It also lists significant actions during WW 1. My family connections are with the Royal Artillery and Home Guard, so this find is interesting. 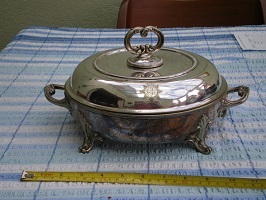 But thought the picture may be of interest for your web-site. 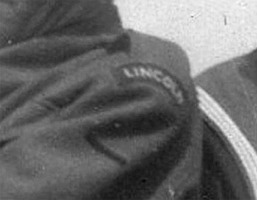 My name is Roger Heathcote and recently I found in my mothers old pictures, one of my father, (deceased 1991), with the word LINCOLN clearly visible on his epaulette. 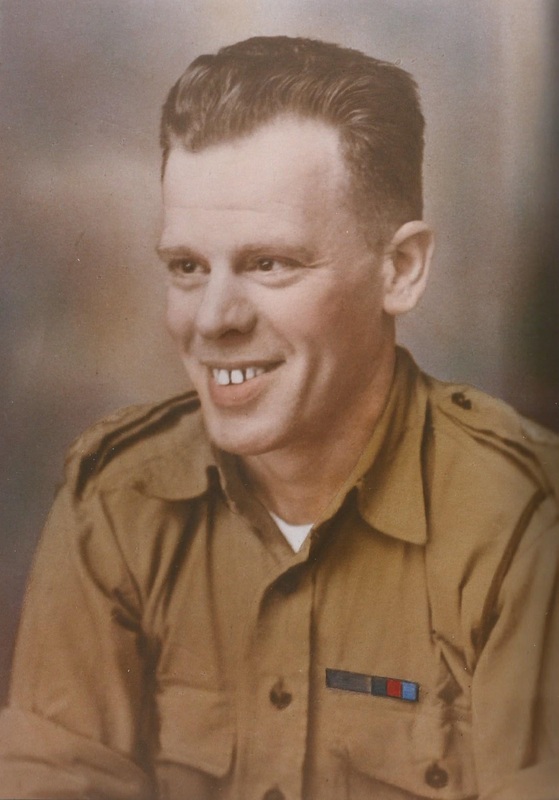 I know Dad served in France in about 1944, was wounded, invalided home, then spent the latter part of the war on a searchlight battery in the north of Scotland. That is about all. His full name was Frederick Heathcote and he came from Brampton, Huntingdon. 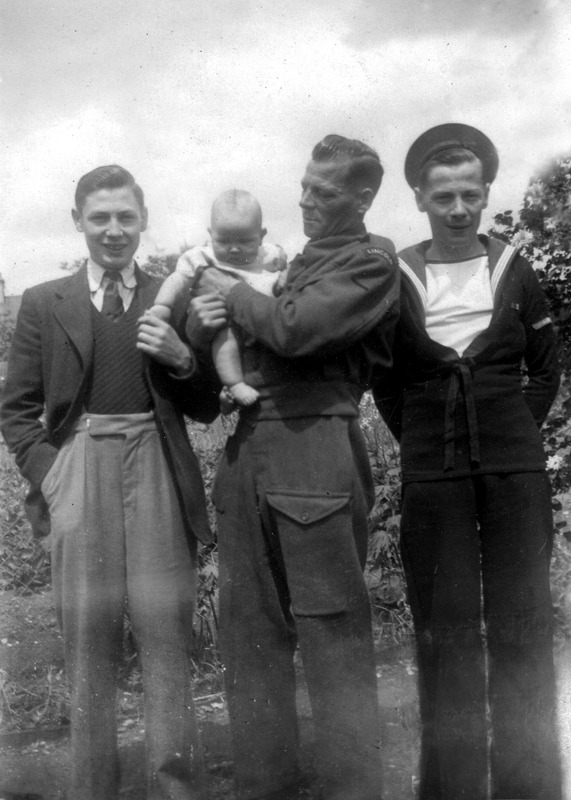 I enclose the picture which is taken with two brothers, Cecil on the left, and Bert on the right who served in the Royal Navy. 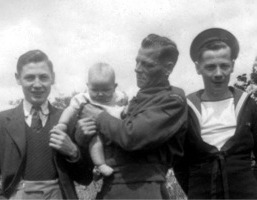 This was taken in 1944 with his son - my brother Leonard. Noted on the back of the second picture is "Tim Rowley, and Bill ?" 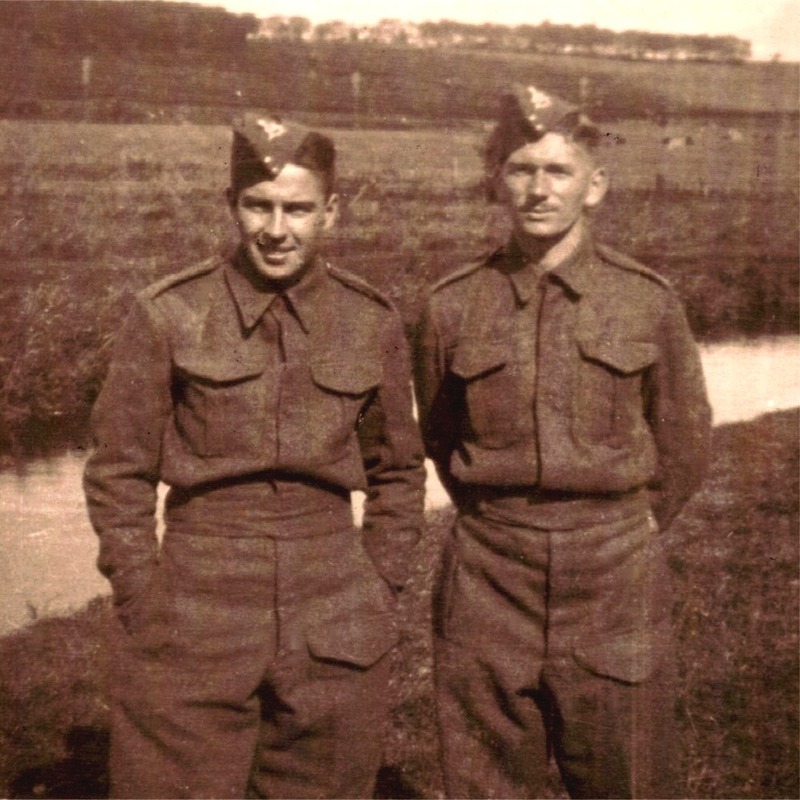 "On looking through some old photographs a couple caught my eye....two snaps of Lincoln privates taken in Cupar Fife Scotland around 1942. They were stationed here for a short spell and made friends with my family. One is named as Jim Rowley and the other as Bill. I would be gratefull to hear from any relatives of these men. Many Thanks and kind Regards." Hi Al, Bob Herd here again, with some good news. 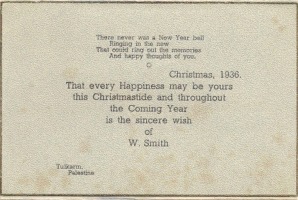 Regarding the two photorgraphs displayed in your blog Cupar (Fife) 1942. I have indeed made contact with the family of Pte. 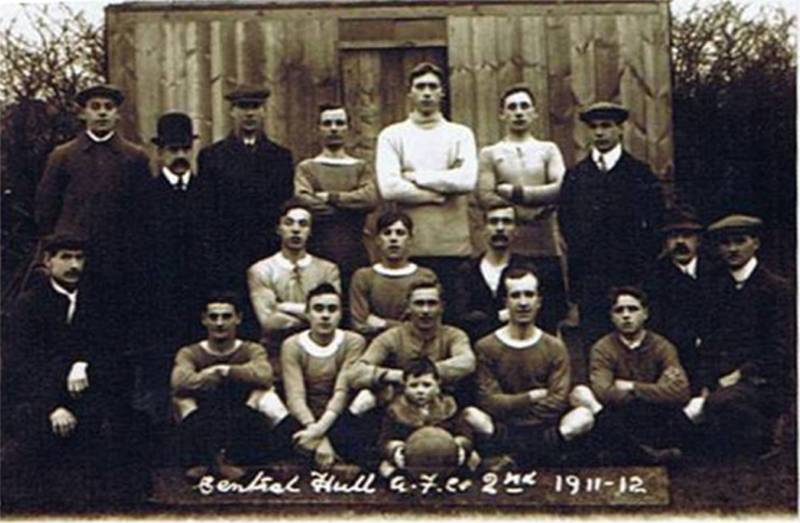 Bill Kibble, who originally came from the Lincoln area, seen on the left of the photographs [above]. His son contacted me this week. Seemingly, after demob, Bill returned to this area, married and settled in the St Andrews outskirts not far from where I live! This has been a very happy ending after all these years, many thanks for all your assistance. 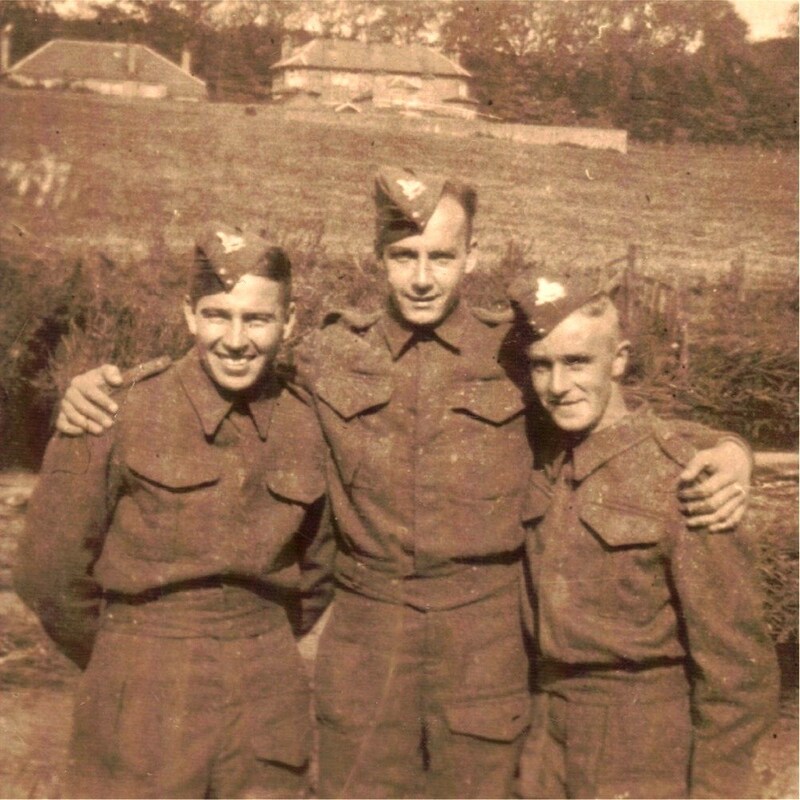 We have received confirmation that the third man in this photograph is John Frisby. This information was kindly sent to us by The Cupar Masonic Lodge. 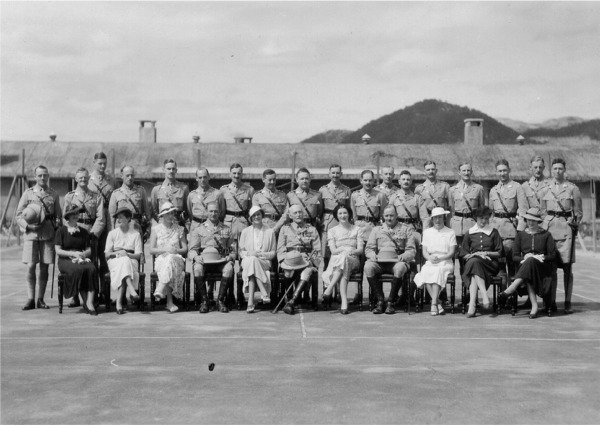 From July 1940, the Masonic Lodge became the HQ of the 6th Battalion. Pte 5827861 H Cowles, died 5th may 1944, age 24. "My father served in one of the Lincolnshire Regiments and the two attached photos were taken by a photographer from Harrogate. Would you or your colleages know where these photos were taken as I would like to visit." 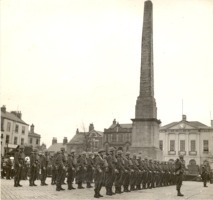 The photographs appear to be taken in Ripon marketplace. The town hall is quite distinctive. Thanks for that info, really appreciate that, I can now visit Ripon. My father John Edward Smith (known as Jack Smith) is on the front row left in the photo without the monument. 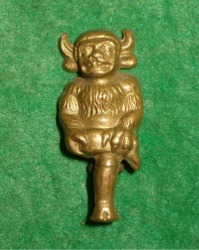 This belt clasp was found in Wiltshire. The owner, Graham Bould, has drawn a blank on getting a positive identification on what regiment it relates to, although he suspects it to be the Lincolnshire Regiment. 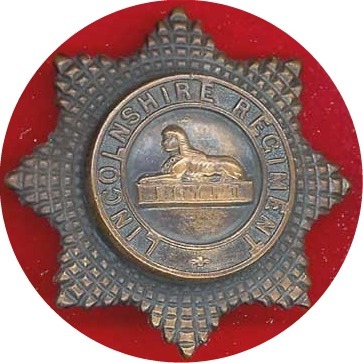 If you can help please email Graham at graham@grahambould.net or the webmaster of this site postmaster@thelincolnshireregiment.org or phone 01747 860072. 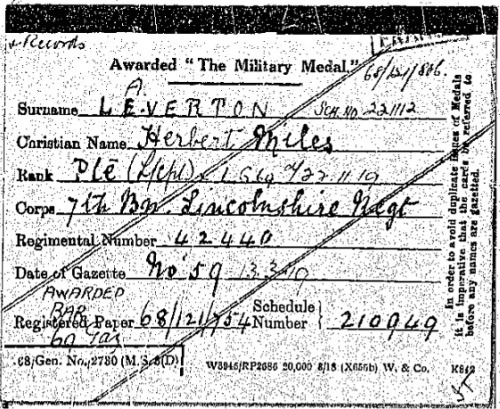 My name is Bernard Laverton, and my grandfather Herbert Miles Laverton served in the Royal Flying Corps(RFC) and the Lincolnshire Regiment and received the Military Medal and Bar - he is listed in C.R.Simpsons History of the Lincolnshire Regiment on page 500 with rank L/Cpl. He started in the RFC's Balloon company, but transferred to the infantry later as he had no dependents at that time and was willing therefore to take the risk. He was 38 years old in 1914. 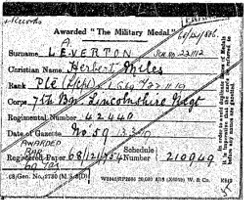 He was originally gazetted under the mis-spelled name "Leverton". We were in Malawi last year and came across this grave of CSM Parish from WW1. 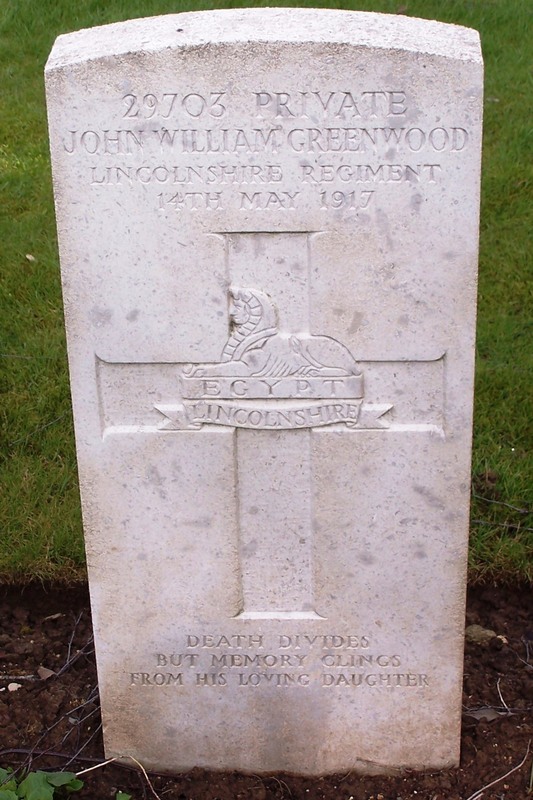 There were a lot of graves of Egyptian and East African soldiers but we were struck that this seemed to be the only Lincolnshire man. We thought we'd send it to you in case it is of interest e.g. to family. Harry Parish was born in 1899 in Belchford, son of William and Sarah. The 1891 and 1901 Census show the family still in Belchford but by 1911 Harry was a kitchen hand at the Eagle Hotel, Woodhall Spa. He enlisted as a regular soldier in the 1st Battalion, Lincolnshire Regiment and as a member of the British Expeditionary Force landed in France on the 13th August 1914. 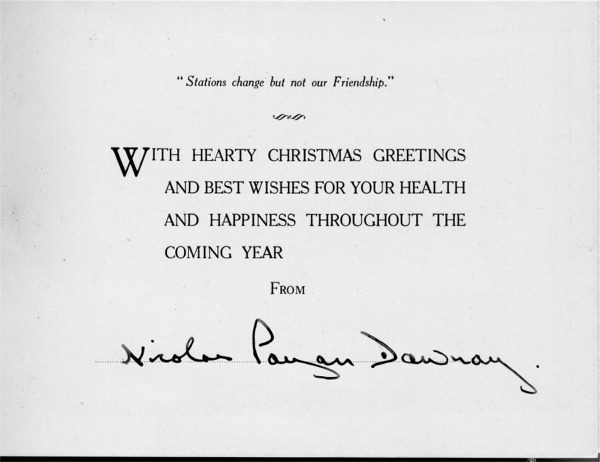 He was Mentioned in Despatches on the 17th December 1915. At the time of his death he was attached to The King's African Rifles, Battalion unknown. Whilst I would not expect you to undertake any research on our behalf I wonder if you would be kind enough to consider the attached photograph and tell us what information can be gleaned from the picture eg rank medals etc. 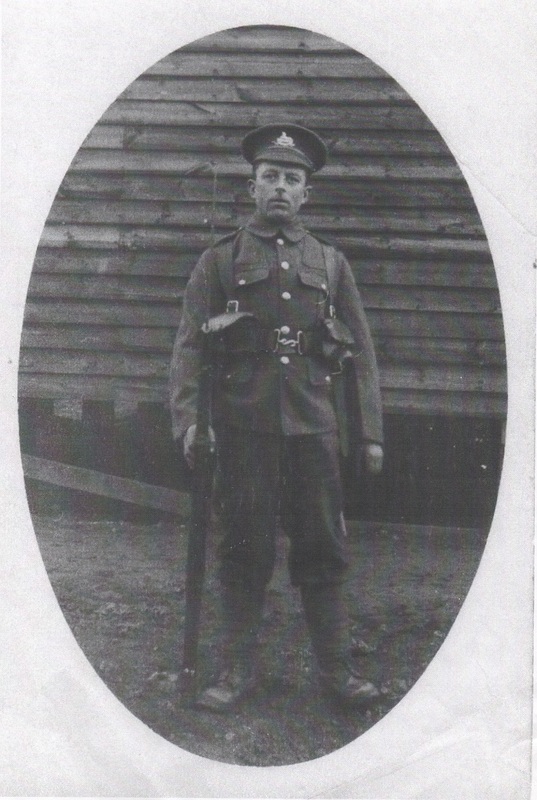 The gentleman pictured is George Deakins who we know served in the Lincolnshire Regiment. Any information that you could give would be much appreciated. If the photograph is of any use to you please feel free to use it as required. 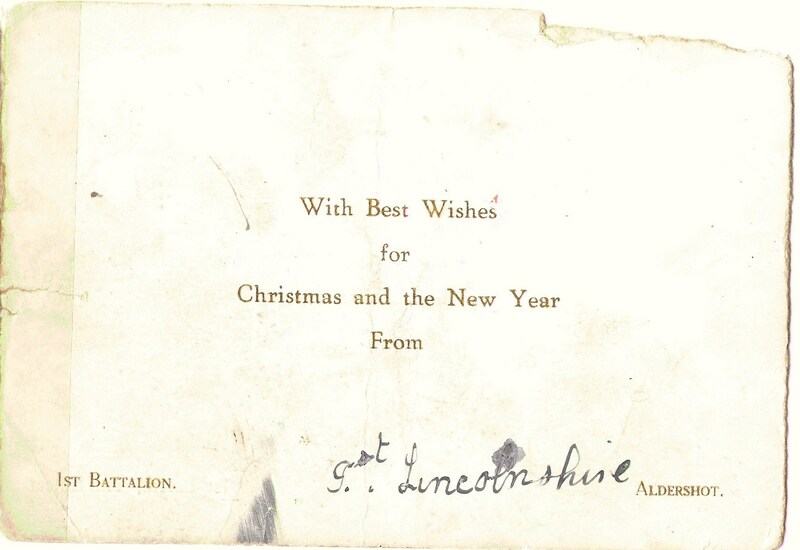 We have had a most useful and exciting reply from Caroline Frisby [Collections Officer, The Regimental Collection, Museum of Lincolnshire Life, Lincoln]. 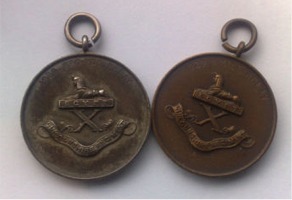 For your interest she has identified the medals as a Sudan medal and a Khedive's medal which points to him being in the 1st Battalion Lincolnshire Regiment as they served in the Sudan in 1898. She has also provided us with a detailed description of the medals including how and when they were won. Your interest in this matter is much appreciated. This is the photo I promised to send a couple of months ago of my Grandfather William Scott 8013, who is in first left in the back row. 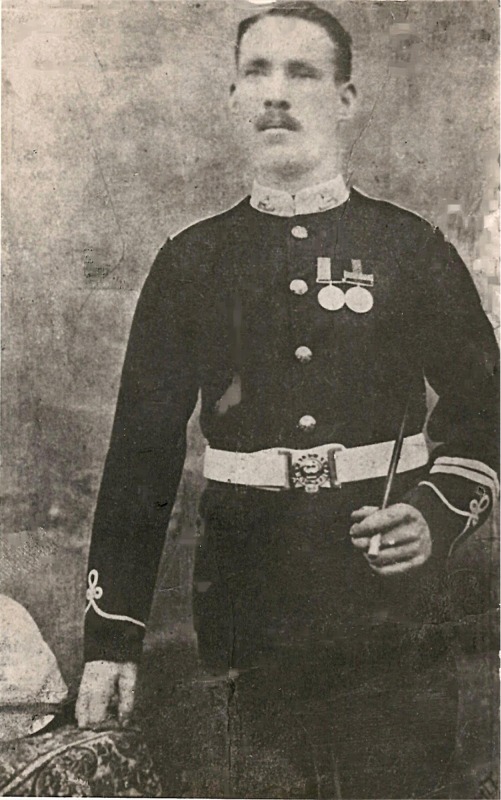 William Scott 8013 served, with the 1st Battalion Lincolnshire Regiment, in India before the 1st World War, he was a boxer and, whilst in Poona, he fought ex-Bombadier Billy Wells. In 1912 he won the Bayonet fighting championship in Portsmouth (open to the British Army and Navy). 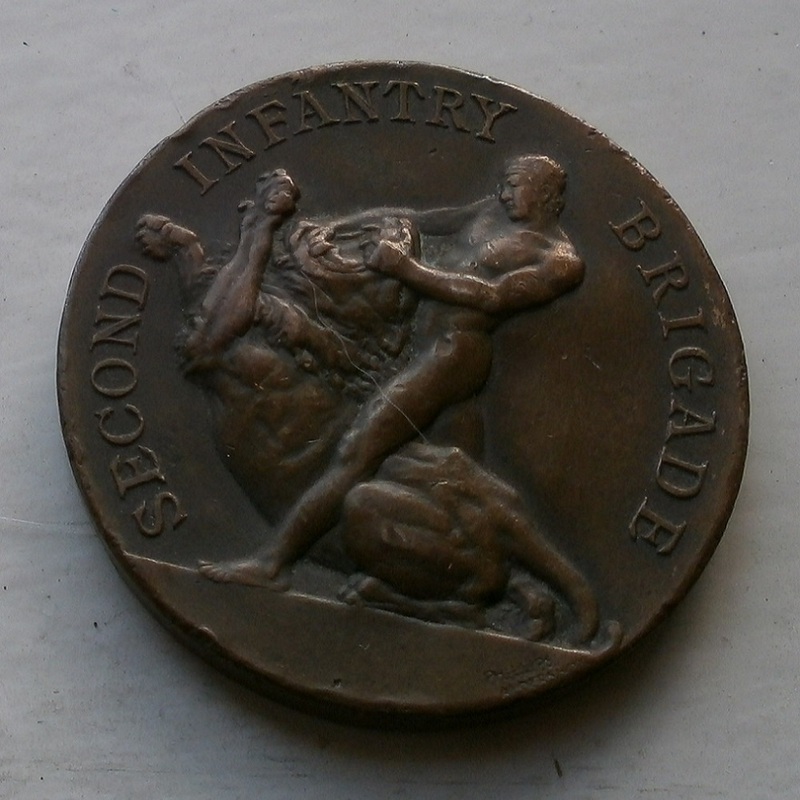 In the Great War he was awarded the Meritorious Service Medal (I am not sure why). He was also mentioned in dispatches on 13th November 1916. Sadly he died aged 51 before I was born. Please find attached a photograph of my Uncle Harry. Pte H.A. 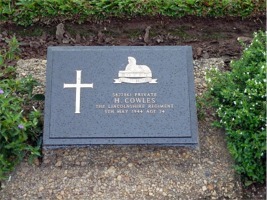 Larner served with the 1st Btn Lincolnshire Regt and was KIA at Palembang on the 30th of March 1946 while serving in the Netherlands East Indies. 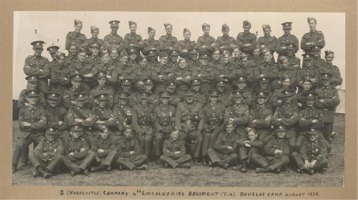 Attached are a couple of photos of the Lincolnshire Regiment. 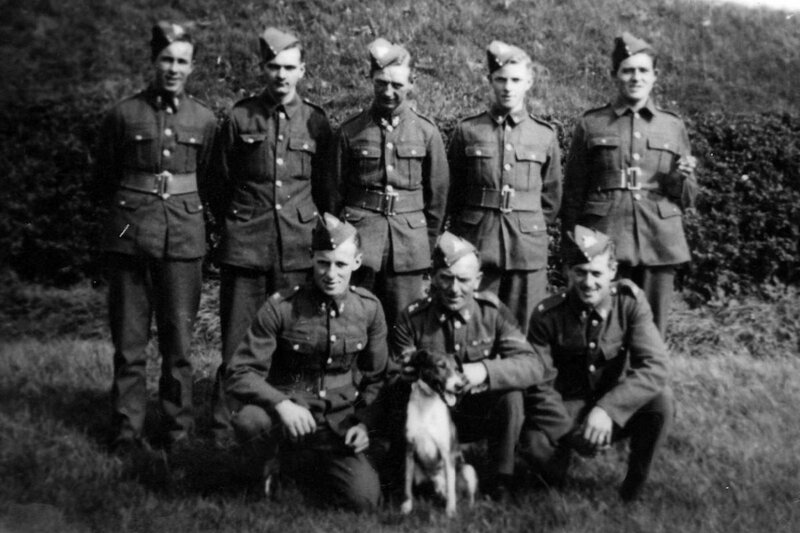 The lance corporal sat with the dog is Frank Dawson who I'm told was an officer's batman in the 1940's. 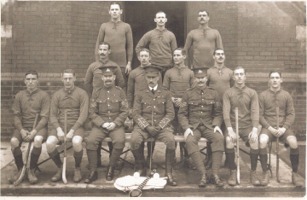 He is also in the other photo now as a sergeant (seated with flat cap). He lived in the Saxilby area in 1939. I've spoken with Frank Dawson's son who lives in Scunthorpe and all he remembers is that his father was based at Kirton Lindsey. 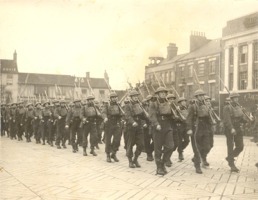 I have made further enquires and been told that the photo 1 is of the 5th Battalion Lincolnshire Regiment which was a Search Light Unit. 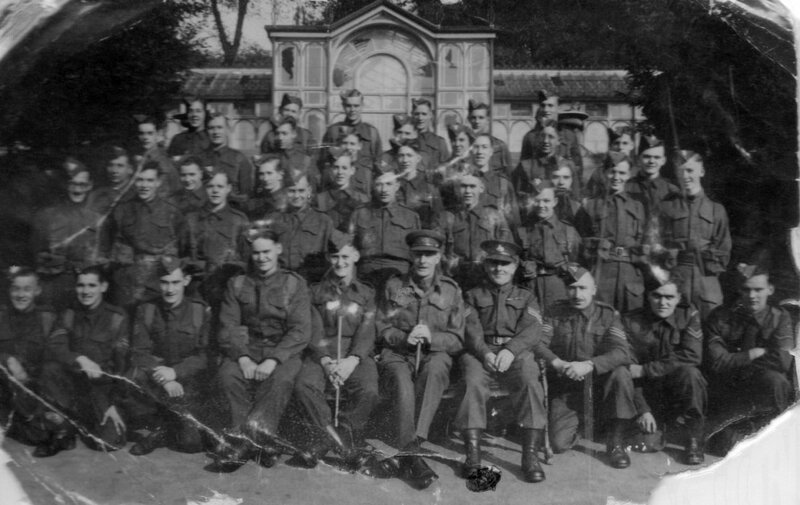 I am told the second photo is of the Home Guard. Yes, please post the photos up on the web site. I was sent this photo by a chap from work. 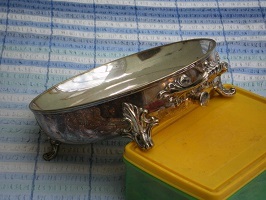 He found it whilst clearing out after a family bereavement. He will keep his eye open for other artifacts. John Gooding, Secretary, The Royal Lincolnshire Regiment and Royal Anglian Regiment, Regimental Association, Lincoln Branch. I thought the Regt. 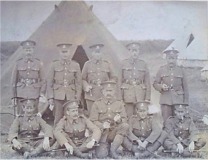 might like a copy of this photo from the First World War of my Grandfather Sgt. John Henry Newell of the Lincolnshire Regt. 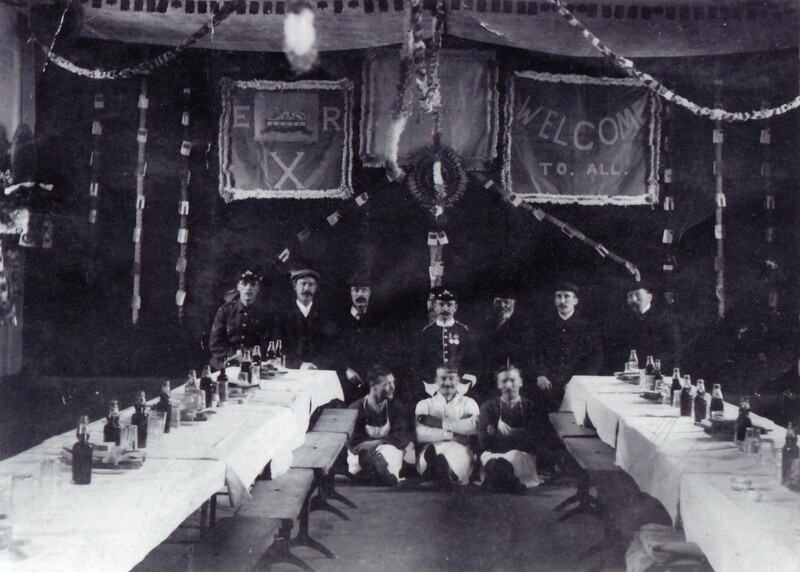 He is the chap in the white outfit seated in front. I don`t know when and where and what this function was all about. I assume it was in the earlier part of the War because sometime later he transferred to the Royal Engineers. He won both the Distinguished Conduct Medal and the Military Medal. 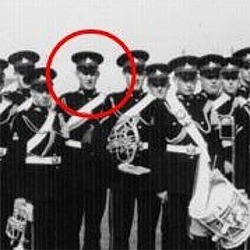 One of those was when he was with the Royal Engineers. The other one he won while in the Lincolnshire Regt and was for crawling out into no man`s land to rescue his wounded Captain. He died before I was born, so if anyone knows anything about this photo or how I can find out more about my Grandad I would greatly appreciate it. 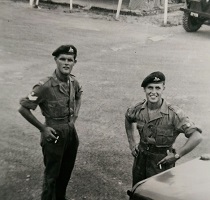 My husband served in the Lincolnshire's in Malaya 1957-59. We recently lost all of his memorabilia whilst moving house. I wonder if anyone can help - perhaps by contacting us or posting pictures, so that I can build up his collection once more? His name is Michael Barnsley and he is now 71. He served with the Lincolns after being trained in the Royal Warwickshire’s. He lived in Nuneaton and served with a few local lads. He has seen a photo of Cpl Geordie Shaftoe on your site and also Sgt Kirk. We would love to hear from anyone who may remember Michael. I live in Western Australia I have been researching my paternal family history. 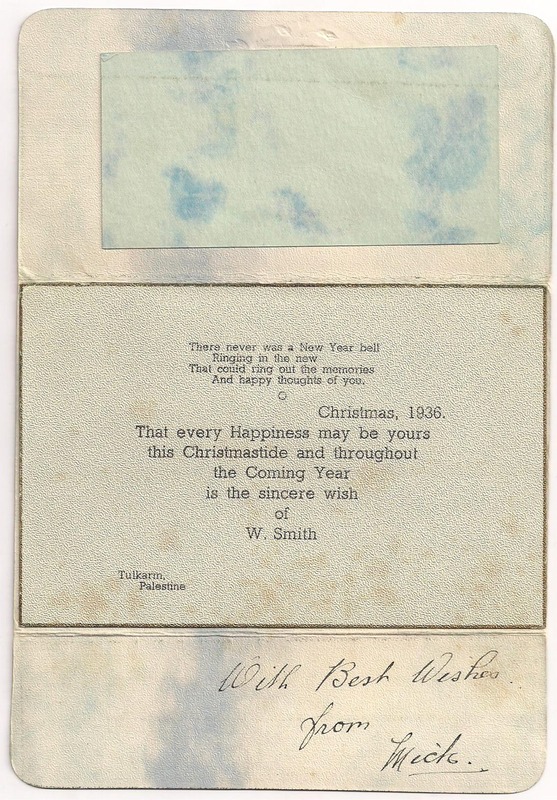 I have been given memorbilia that was my grandfathers from WW1. The memorbilia includes photos and amongst them was one photograph that had written on the back: 'JW Stanley, Grimsby, Lincolnshire'. My grandfather fought in France he was in the 11th Batt AIF he was wounded in battle 3 times and taken POW. 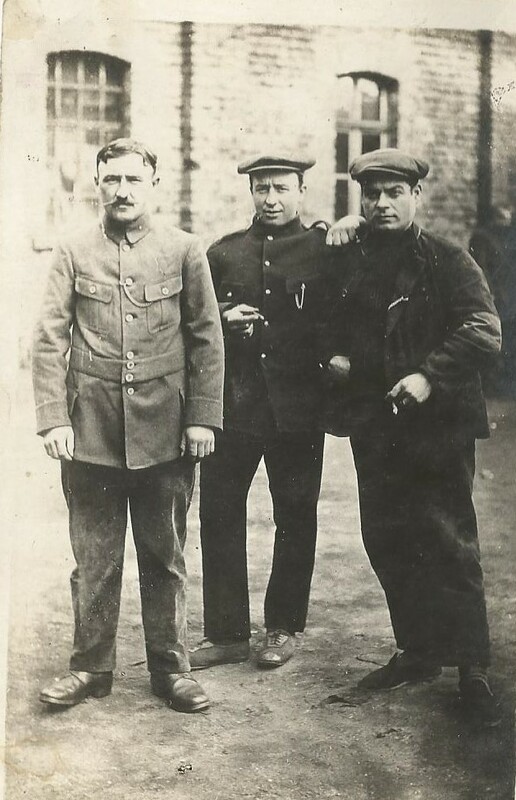 I believe that the photo of JW Stanley may have been taken in a POW camp. Thank you for reading this email. I have just seen a photograph of someone I recognise on your website. I believe the picture is of my grandfather - Sergeant (3352) 240831 Jack (John) William Stanley - 2/5th Battalion Lincolnshire Regiment who was a POW. 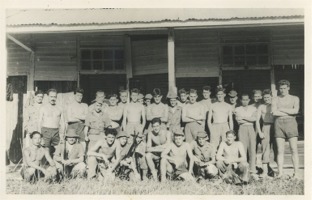 My grandfather was particularly found of all things Australian as he spent time with Aussies in camp and he said they were fantastic blokes. I would love to get in touch with June Walker if possible. 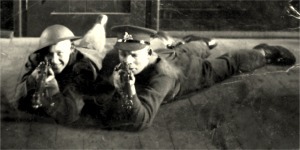 I have attached the only adult photo I have of Jack – taken just before the war 1912. Looking left to right, he is the 4th Player sat in front row (with hair which is receding a little already on top and white neck band). 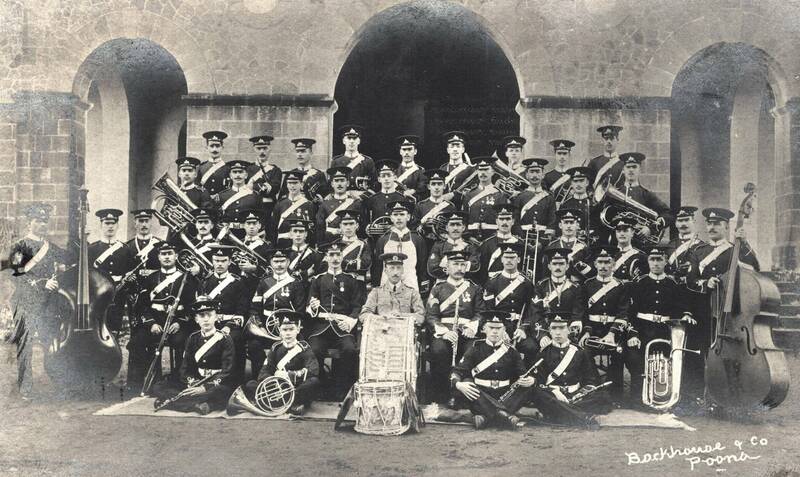 1st Battalion Band, Poona (1902-1910). I have passed a copy of the attached to Ms Sleight [Collections officer, The Lincolnshire Regimental Collection, Museum of Lincolnshire Life, Burton Road, Lincoln.] and I thought you might also like a copy of this old postcard which I have just acquired for my collection of British Army Bands. Having carried out some research I am quite happy to say that this is the Regimental Band of the 1st Battalion The Lincolnshire Regiment photographed in India between 1902 and 1910. This email accompanied the photograph: "A friend of mine - Wayne Coulam of Barton upon Humber - has recently found that his father, (Alan?) Stamp, was a Lincolnshire Regiment man. 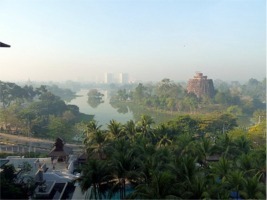 He is in the middle of the photograph. Wayne is hoping that someone may be able to contact him with information about his father. We think they served abroad in the 1950s and that Alan Stamp was very keen on sports. He was killed in a road accident near Doncaster in 1967, when Wayne was a baby. Any information would be gratefully received. 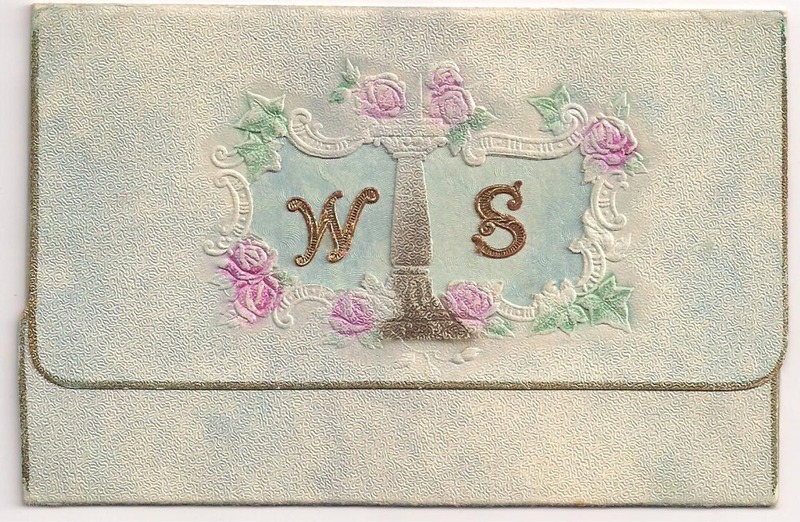 Dear Sirs, Yesterday (24 Feb 2008) at Honfleur (France) I bought a card for Season's greetings of your regiment. 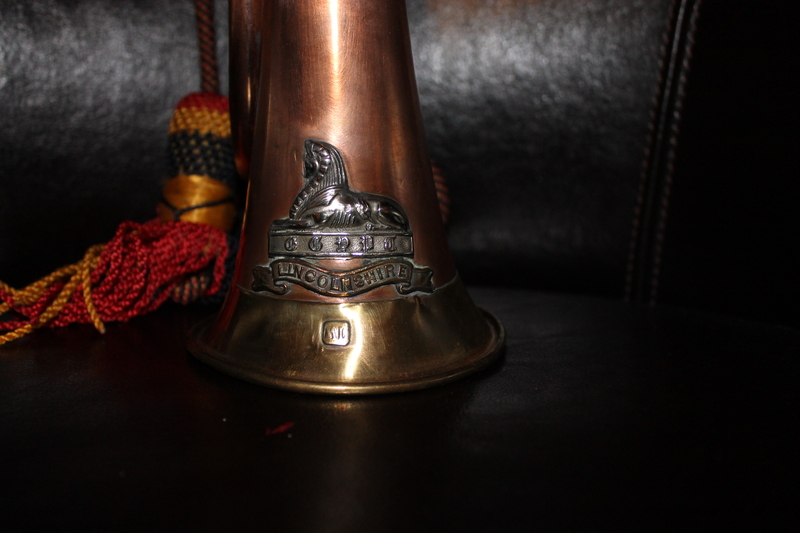 It certainly shows the commanding officers of the regiment when in station abroad. Jean-Paul Herbert, Le Havre. My name is John Jay and I am the elder son of the late Alec Jay, who was a rifleman in the Queen Victoria’s Rifles and was captured at Calais in 1940. He was marched into captivity alongside RSM Paddy Martin of the Lincolnshire Regiment, whom, I presume, had been picked up near Dunkirk. My father told us that during the long march away from the coast and into Germany that he acted as interpreter for RSM Martin. I am in the midst of researching my late father’s wartime experiences and am keen to fill in various pieces of the jigsaw puzzle. I wonder if you know whether RSM Martin is still alive or whether you are in contact at all with his family. I have attached a group photo of my father taken in “the bag” to this email. My father is the soldier in the back with the moustache. I have made some progress on my researches on RSM Martin. 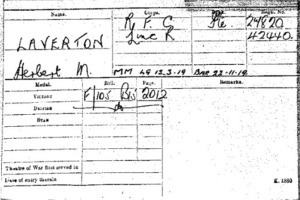 I have discovered his MI9 POW questionnaire and I now know him to be George Alexander Martin – Paddy must have been a nickname because he gave his private address on returning to Britain as Convoy, Co Donegal, Eire. 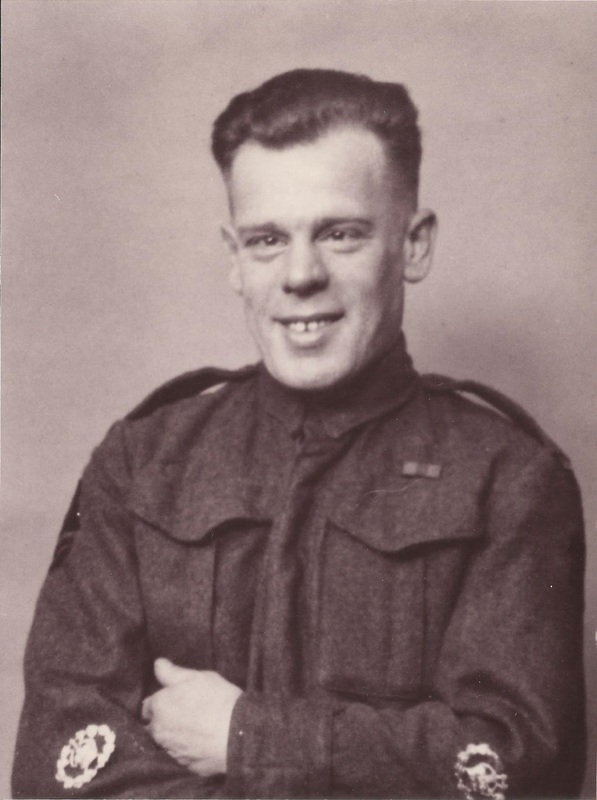 He was, indeed, captured near Dunkirk on 30.05.40 and was in Stalag VIIIB. His three working parties were Sandhubel, a granite quarry, Arbeitkommando 4030 at Freiwaldau and Reignosfeld if my reading of his handwriting is correct. The first two I have confirmed through Google; the last not. I hope this is useful information relating to my inquiry. 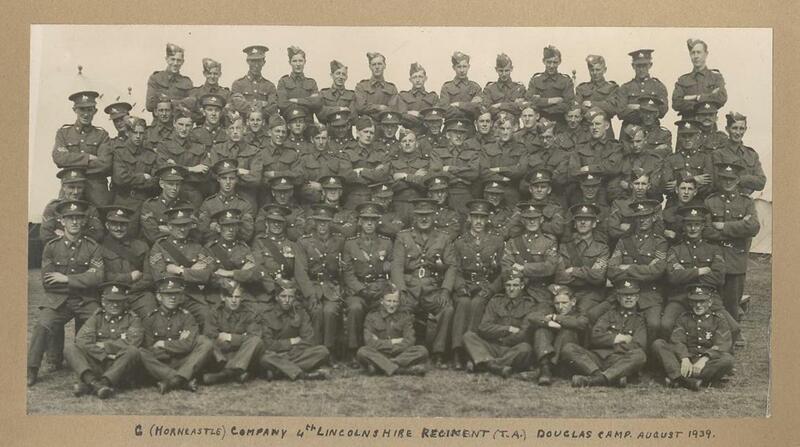 Douglas Camp - Horncastle TA at the outbreak of WW2, mobilised as B Company, 1st September 1939. 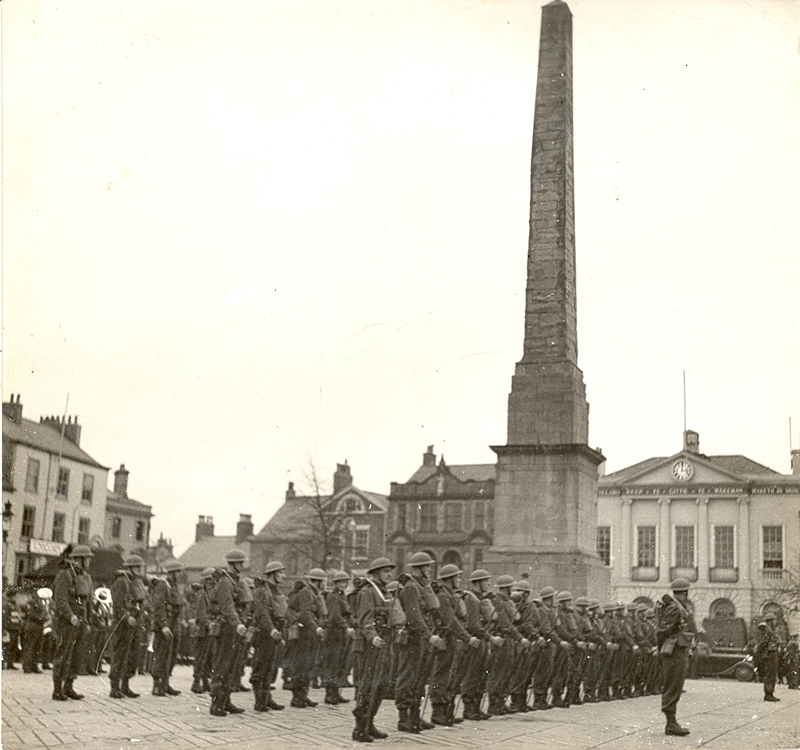 Photograph courtesy of Caroline Sleight, Collections Officer, Regimental Collection, The Lincolnshire Regiment, Museum of Lincolnshire Life, Burton Road, Lincoln. 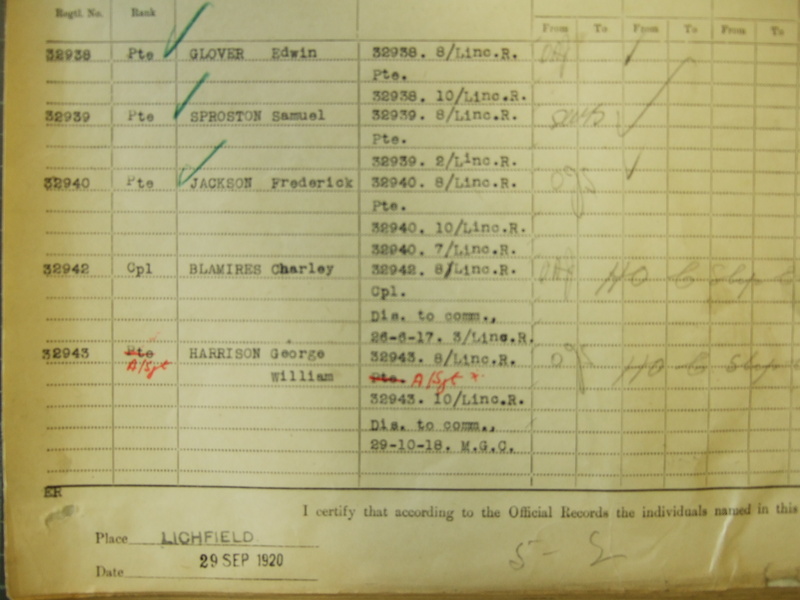 I am in the process of tracing my uncle's service in the Lincolnshire Regiment. My uncle died some years back. His younger brother (my father) remembers certain things about Walter, but Walter did not discuss too much about the war. 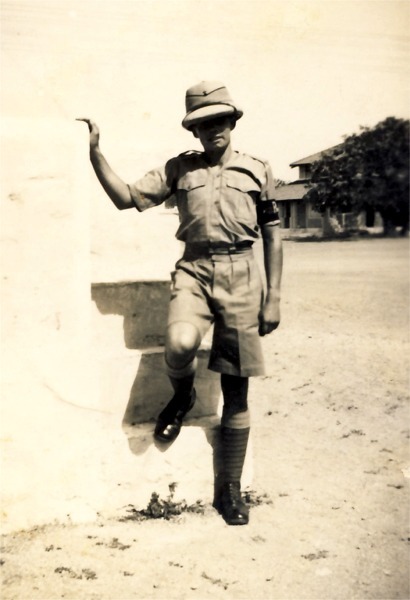 Walter served in India during 1938 - 1939 and my father commented that, when Walter came home, his own father did not recognise him because he had quite a dark skin - presumably from the Indian sun. Walter was involved in Dunkirk - so my father says. Walter may also have been at Arnhem. Walter had 1 child, a daughter, who would now be well into her 60's - but I have no idea where she lives or her married name. In the first photograph, the Imp badge of the 4th Battalion and the Polar Bear (the Divisional flash of the 49th Division) can be seen on Raymond Tyack's right sleeve (pictured sometime during WW2). [Raymond Tyack is now 90 and living in Australia! - Al.] 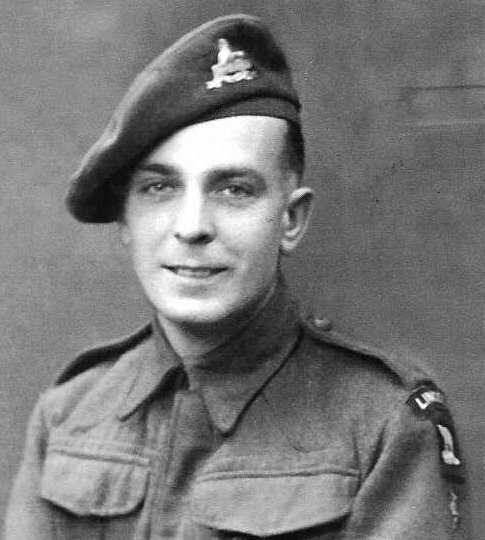 In the second photograph, both these badges can be seen on the left sleeve of Private George Bridges, of Cleethorpes (pictured in Brussels in 1945). We already know that the Polar Bear was worn on both arms and these pictures seem to suggest that the brass Imp badge was also worn on both sides. "I would be pleased if anyone could shed any light upon the Imp worn on the sleeve by the 4th battalion in WW2. When was it first worn? Did the 2nd battalion, also in Normandy, wear it? I have a photo of a 4th battalion Corporal who was awarded the MM in the fighting to liberate Arnhem in April 1945 - and he's not wearing the Imp.Best wishes, John Benson, 22nd December 2008." "I have now heard from Paul Mantripp, the nephew of Doug Collier(now almost 91) who was in the anti-tank platoon. Doug says that this unofficial badge was first issued when the battalion was in Iceland and was worn throughout the campaign in Europe. Doug wore his until he was demobbed. 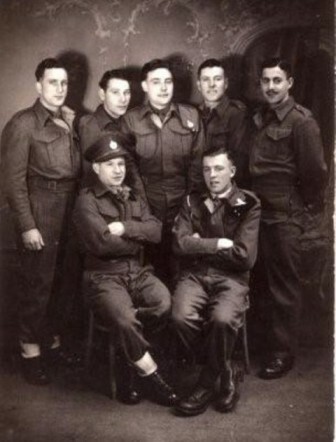 Prior to D-Day an inspecting senior officer said that the badge should not be worn as it was not an official issue, but nothing more was heard of this, possibly because Major Stokes intervened. Could this senior officer be Monty? 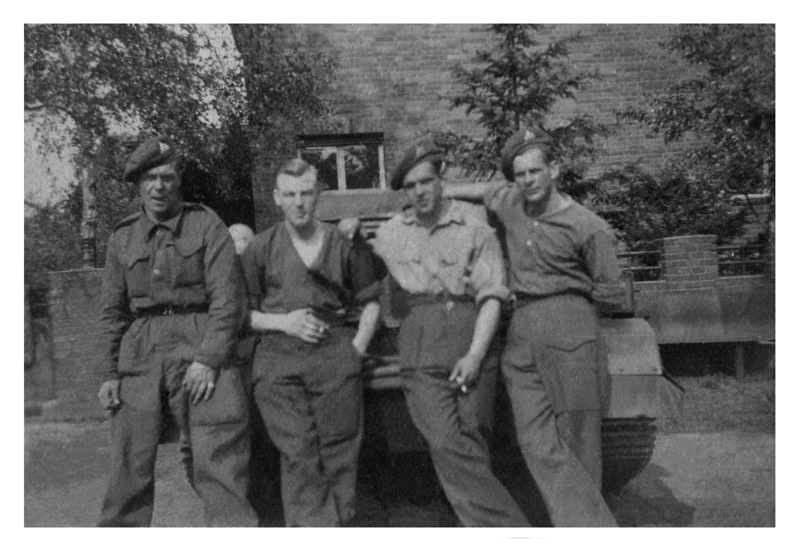 He liked to stand on the bonnet of a jeep and have the men gathered round so that they could take a good look at him, but the CO (Lt-Col Barclay) refused, saying that this wasn't possible as it was a tradition in the Lincolnshire Regiment that men didn't face each other. Monty got his way in the end and told Barclay that he was a very obstinate young man. It was a strange incident for it was the first (and only) time anyone had heard of this "tradition". Was Barclay, who had a reputation of getting into trouble with senior officers, taking the mickey out of Monty? Many thanks to Doug for his explanation of the badge, which was only worn by the 4th battalion. More photographs of George Bridges. Ray Tyack emigrated to Australia in 1955 and celebrated his 93rd birthday in 2011. Mr Tyack was born on 18th August 1918 while his father was serving as a lieutenant in the RAF. Before joing the British Army he worked as a carpenter. Mr Tyack joined the 4th Battalion of the Lincolnshire Regiment and stayed with them for the six years. He served through postings to Norway, and Iceland (for two-and-a-half years). The 4th Lincolns were active during Operation Neptune (the Normandy landings (D-Day)), the largest amphibious invasion in world history with 160,000 Allied troops landing on the beaches from 5000 ships. Thanks to John Benson for this update. 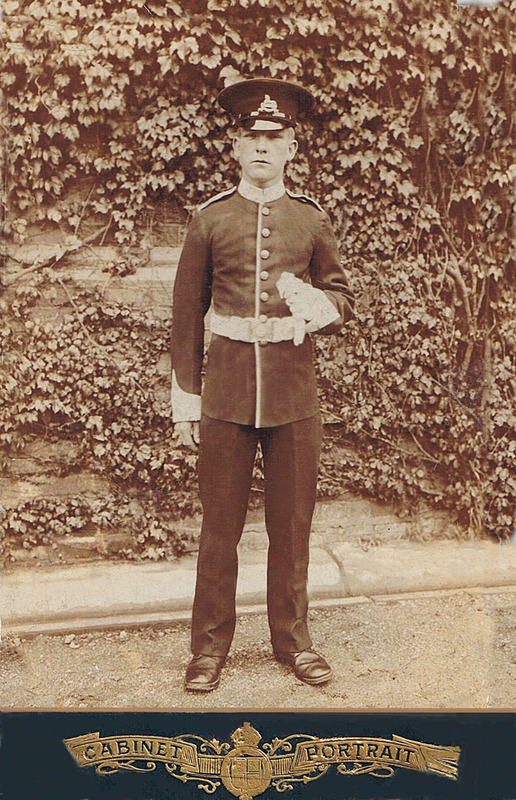 My father - 4804325 Private Percy William Capes - was a "Saturday Night Soldier". He lived near Boston and that joined the "Territorials" in 1938/39. When WWII was declared he was immediately called up and did some training in England before being sent to Norway. We were told most of their company in the "Lincons" were lost - but after a week on the run without food Dad got back to England. He then did Garrison Duty in Iceland in the Ski Patrol before transferring to the Maritime Royal Artillery as a gunner on oil tankers. 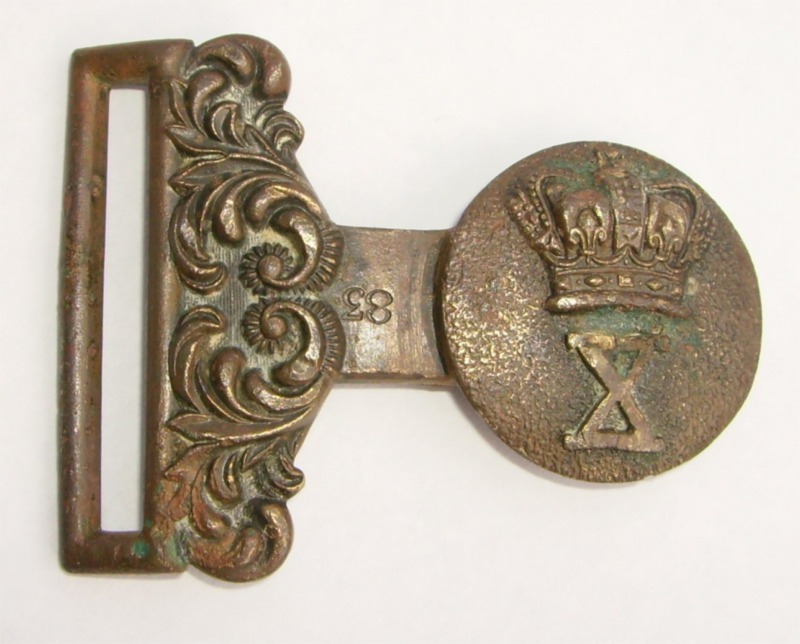 Whilst with the Lincolnshire Regiment, Colonel Robert de Brisay paid to have the brass of their rifle butts made into Lincoln Imp badges to be worn on their sleeves - I still have one of those. Jill Woodward, Doolandella, Queensland, Australia. Dear Sir, My father Charles 'Nobby' Norburn joined the Royal Lincolnshire Regiment in 1943 playing clarinet in the band until 1955, his number was 4810120. I have found his picture on your web-site in several of Mr Barrett's photographs, I have circled him. We have an old photograph album of his and several of his photos are marked with his friends names such as Ziggy, Cliff, Buff and Johnny. 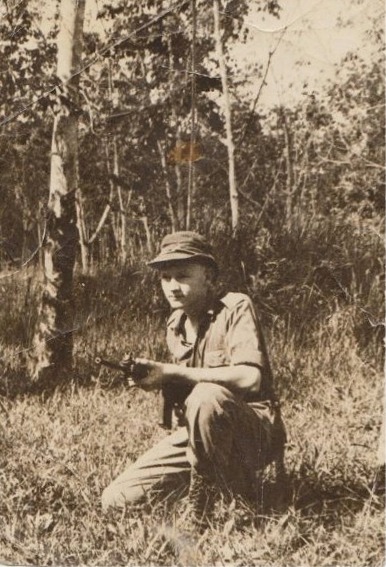 My father rarely spoke of his early days in the army. 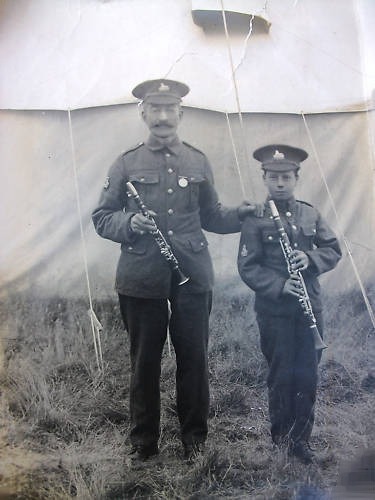 We think he joined the army as a boy soldier, but he had no possesions from those days because they and his clarinet were stolen while in Egypt. 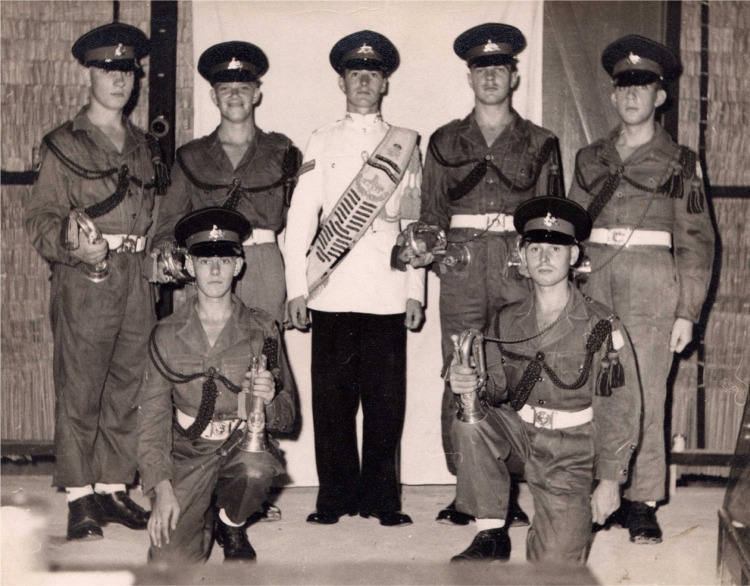 We know that he attended Kneller Hall school of music and served in Egypt, at Moascar he was also stationed in Germany at Goslar and in Berlin. Best regards, Dave Norburn. The King's Badge - a round silver badge, with the words "For Loyal Service - is to be awarded to members of the Home Guard who have been discharged through injury from war service, it is officially announced this morning. Police and members of the Civil Defence Services are also eligible. The badge has hitherto gone to those invalided on pension from the Armed Forces and the Merchant Navy and fishing fleets through wounds or war disablement attributable to service since September 3, 1939. 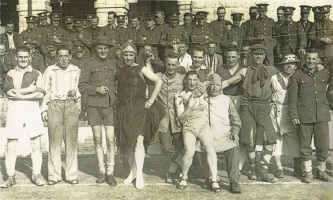 In future, officers and ratings discharged from the Merchant Navy pool because of disablement due to service, and carrying workmen's compensation or similar payments will also be eligible for the badge. Members of the Coastguard will also be able to qualify. 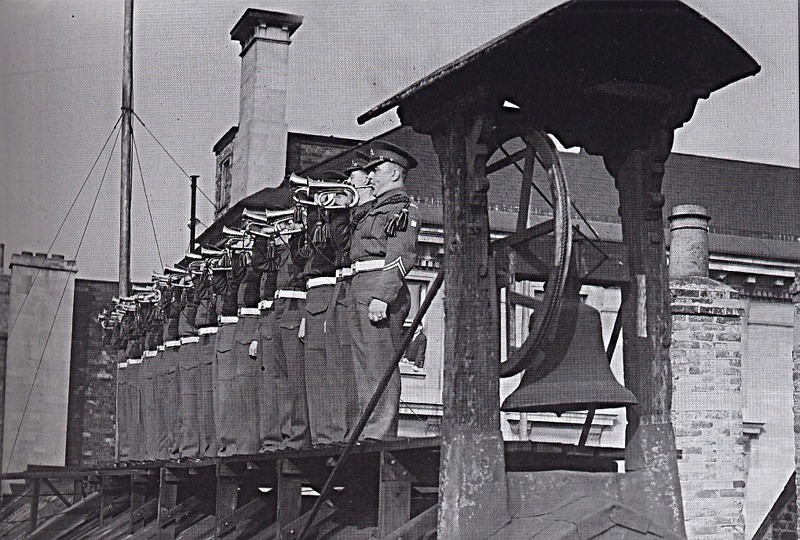 Buglers of the Lincolnshire Regiment sound a fanfare, from the roof of the Guildhall, to mark the start of Thanksgiving Week at the end of WW2 (1945). 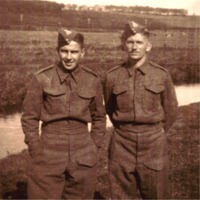 Colin Everitt and George Ward had both lived in Westwick Gardens, Lincoln. 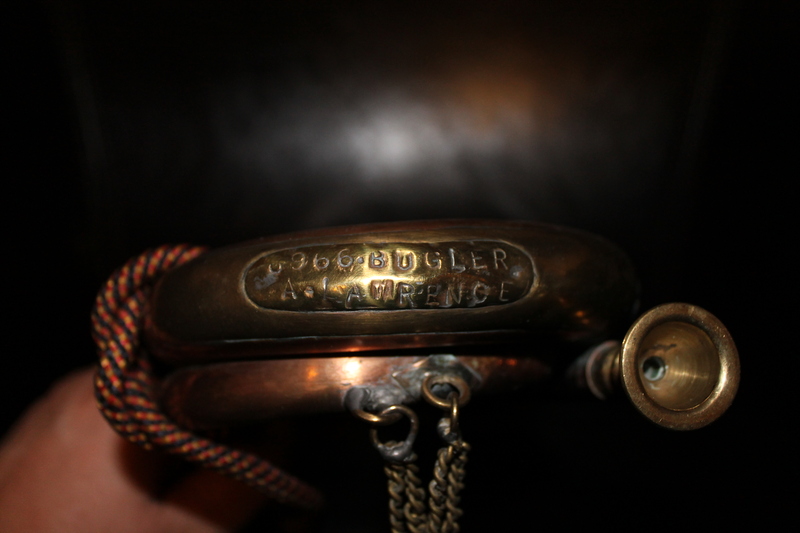 In their youth, Colin was a Bugler with the Sea Cadets, and George a Bugler with the Army Cadets. 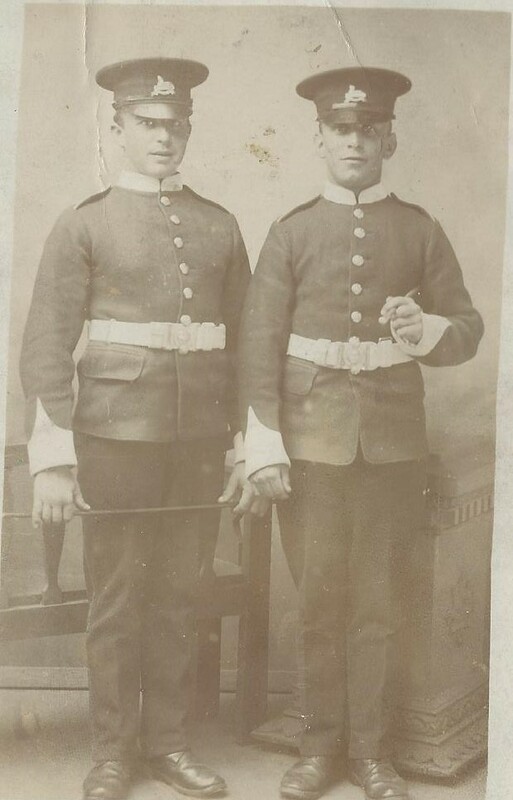 When they were old enough both lads joined the 1st Battalion of the Royal Lincolnshire Regiment. After 2 years in the Malayan jungle, George joined the Corps of Drums only to find that Colin Everitt had got there first. George also followed Colin to serve as the C.O. 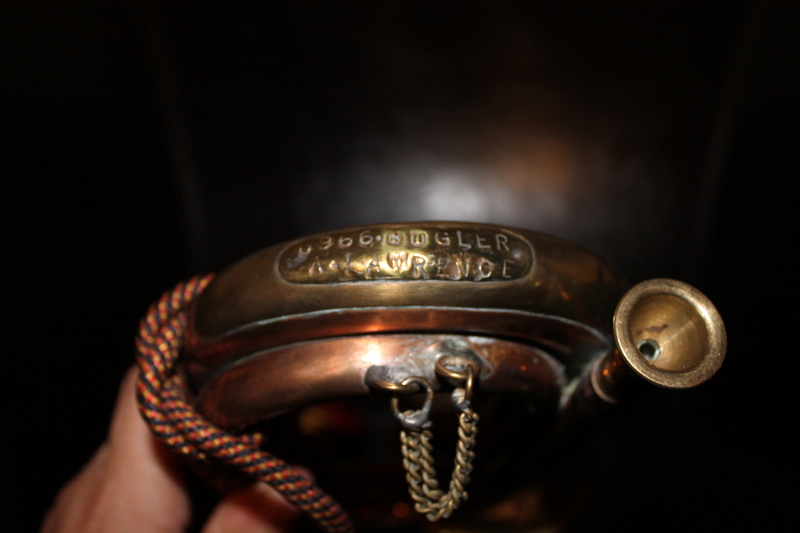 's Bugler in Osnabrook. 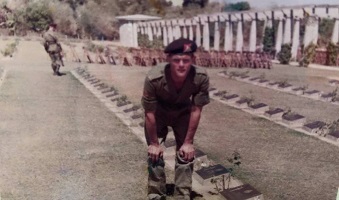 George was made up to full Corporal on tour in Cyprus. Pictures courtesy of George Ward. 7 Aug 2007: "My name is Gwendolyne Holland, daughter of the late Leslie Kirk. I recently came across your site. 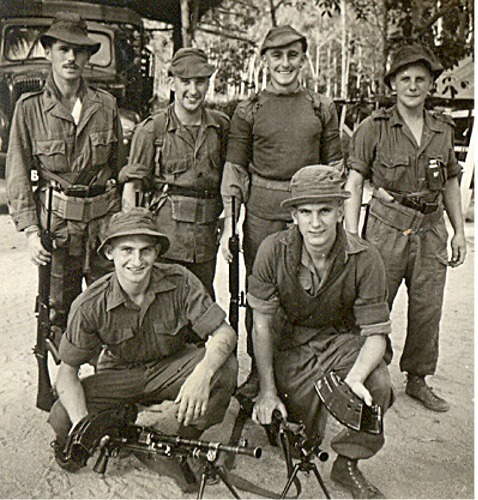 My father was in Malaya in 1957 and I have a photo you might like to add to your site. 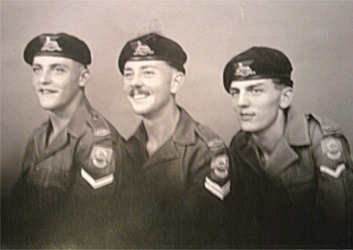 My father is the one on the left with the moustache. There are other soldiers in the photo - maybe someone might recognise them. My father married my mother in Melaka in 1958." Gwen Holland. In the Beach Bar at Penang. The first man who laughed had to pay for all 39 pints. It was Sgt Mick Nugent. 1970. Picture supplied by Mickey Reams. 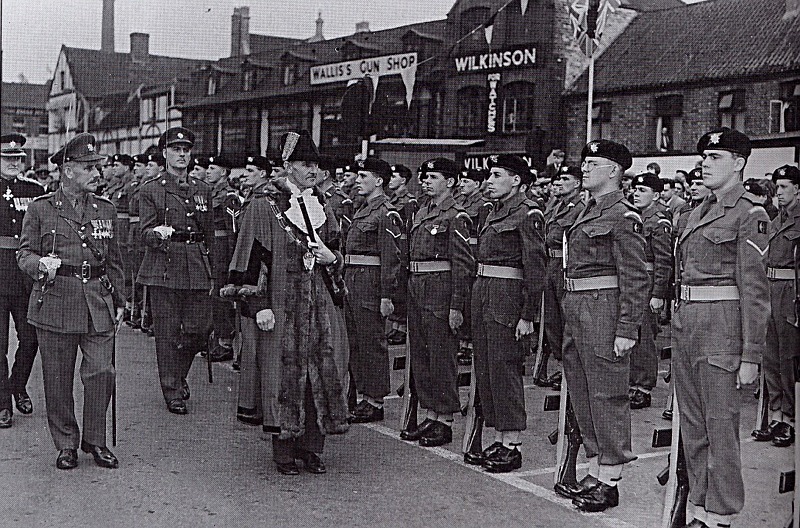 The Lincolnshire Regiment being inspected by the Mayor, in Lincoln, at their farewell parade (1960). The Band of the 2nd Battalion, The Royal Anglian Regiment. Returned to Lincoln from their Cape Tour, 1964-1965. Picture courtesy of George Ward. 23 July 2007: "Hello everybody, thought you might appreciate a photograph from an old Poacher whilst on holiday in Gibraltar during early July. Your treasurer will certainly remember me." 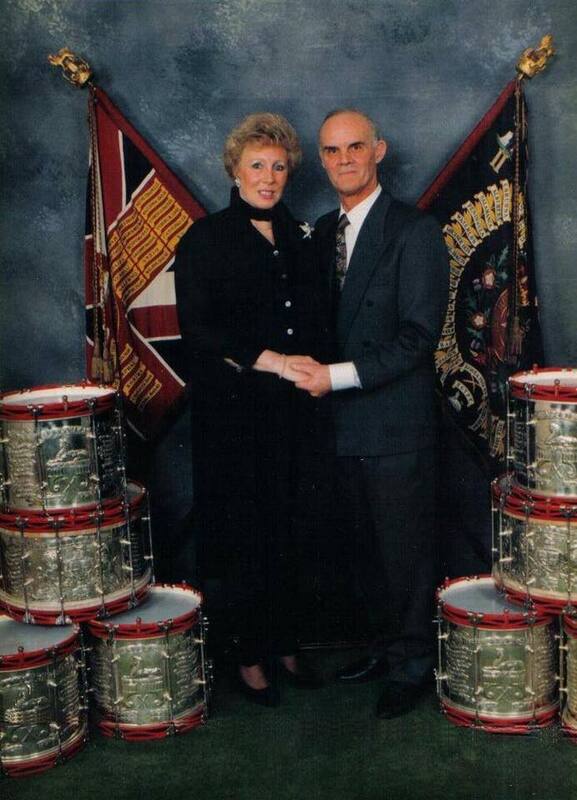 Regards, Malc & Jan Germany (ex Band Staff Sergeant The Poachers, ex Royal Anglian Regiment 1968 - 1993). The sign says: "This Pathway was constructed by soldiers of 2nd Btn Royal Anglian Regt, Dec 1968 - Aug 1969. 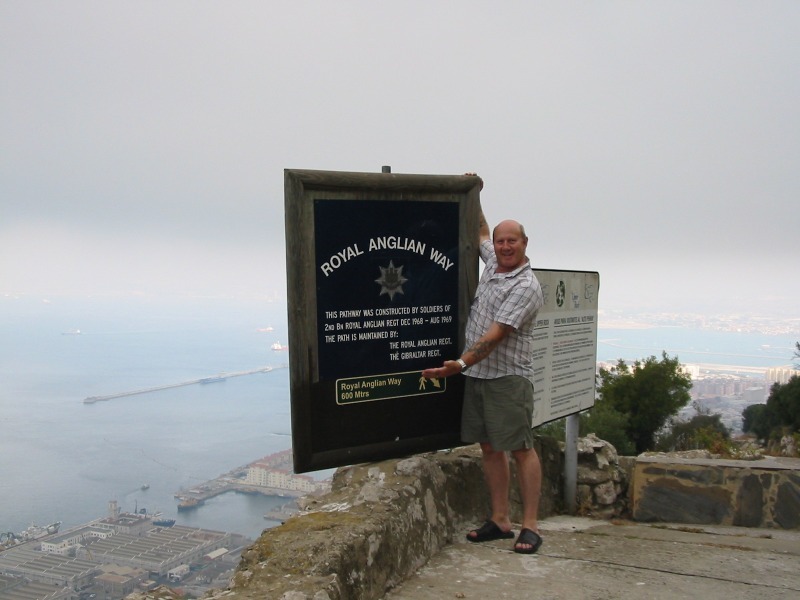 The path is maintained by: the Royal Anglian Regt; The Gibraltar Regt."